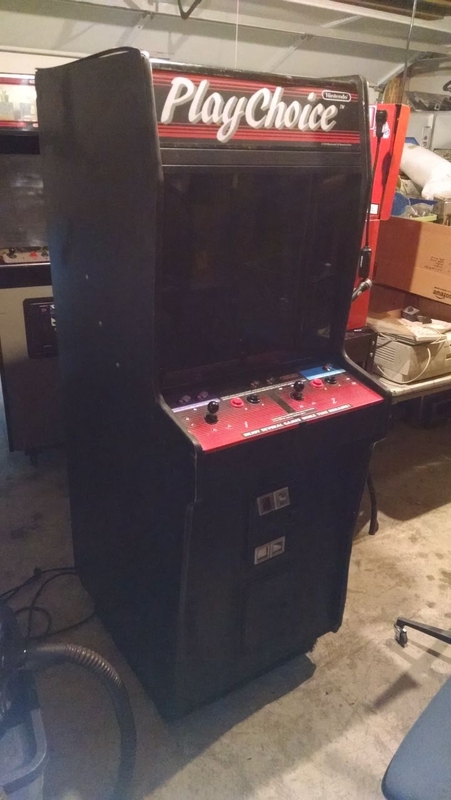 I checked off another project that’s been a long time in coming with this one. 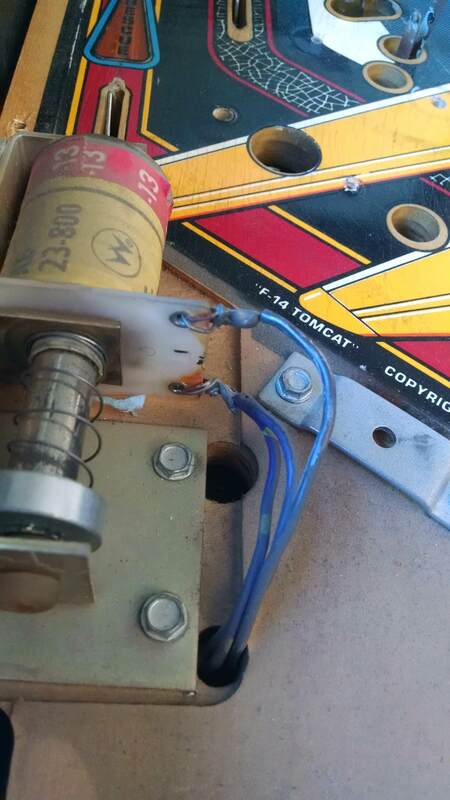 This particular F-14 Tomcat is another of the machines I grew up around at my parents’ shop in Anchorage. 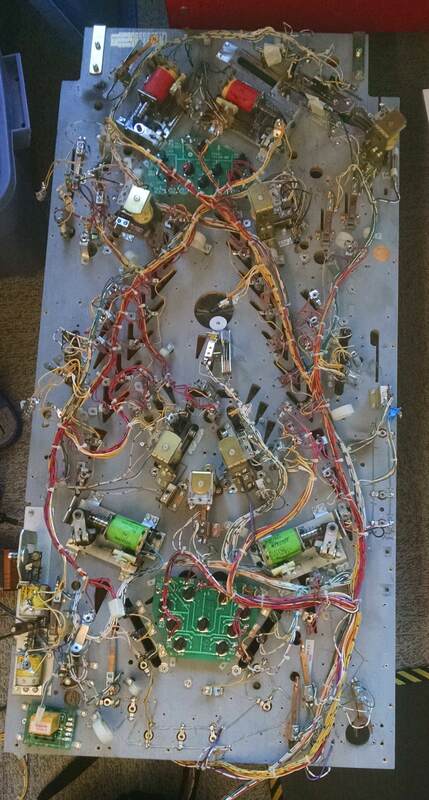 I always wanted to get it working but didn’t have the skills, or enough information to build them, back then. 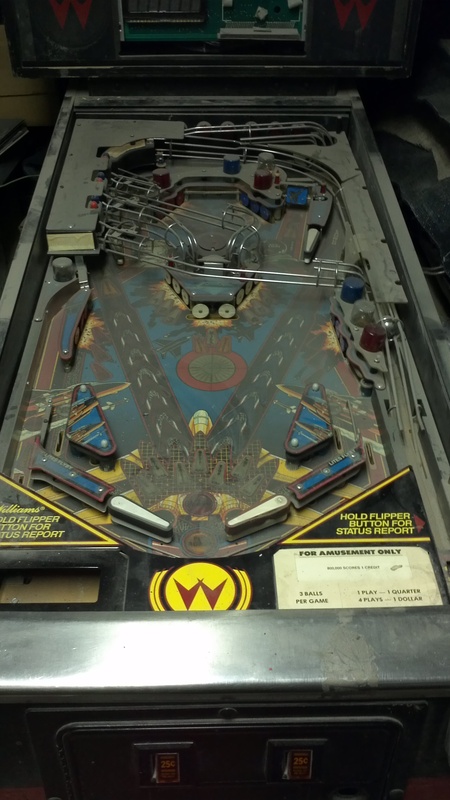 As I got into working on these machines in earnest after my move to Portland, it became another project that followed me down here to join Sorcerer and 300. 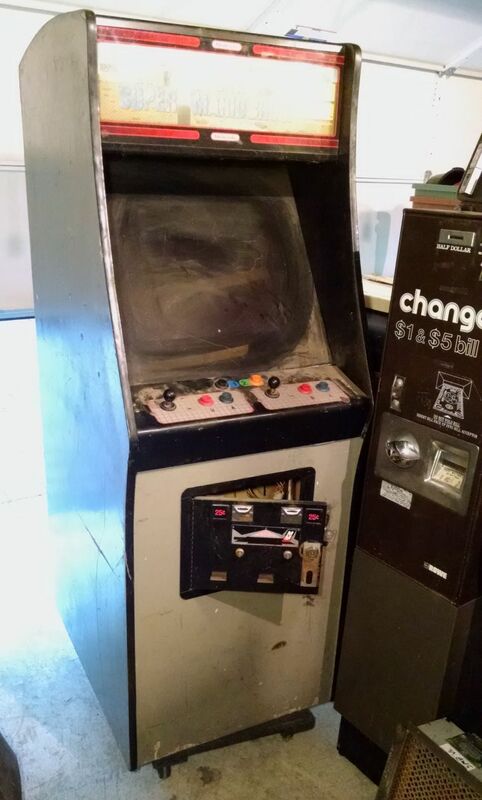 Even then, it sat for quite some time. 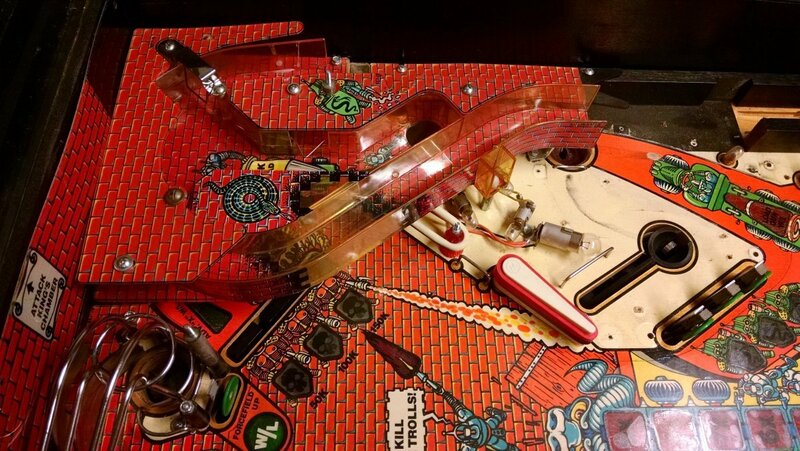 Like most of the production run for this title, it suffered from extensive damage due to playfield inserts lifting out of place. 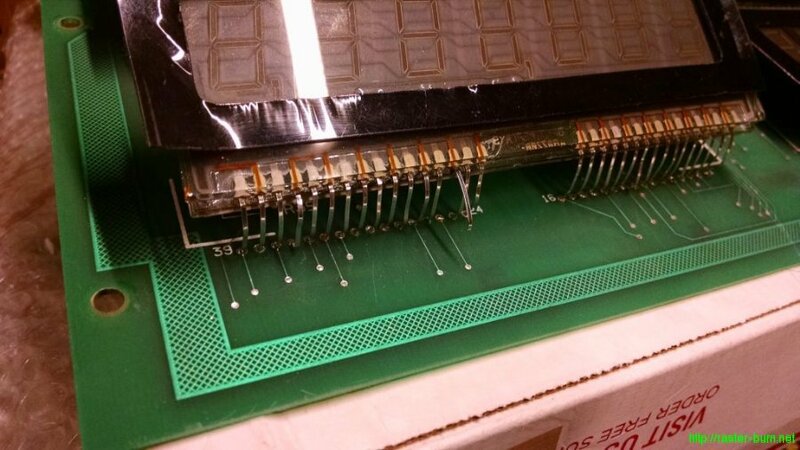 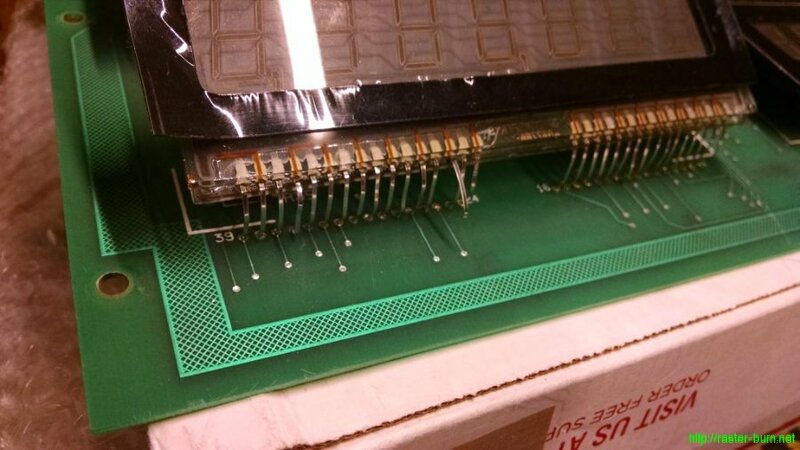 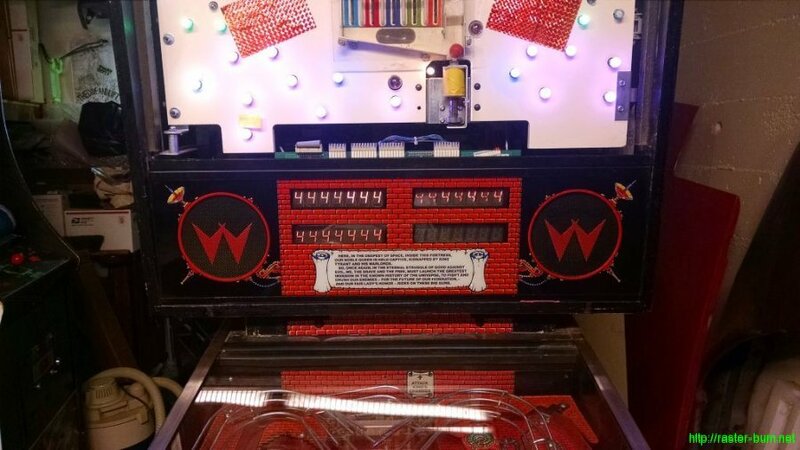 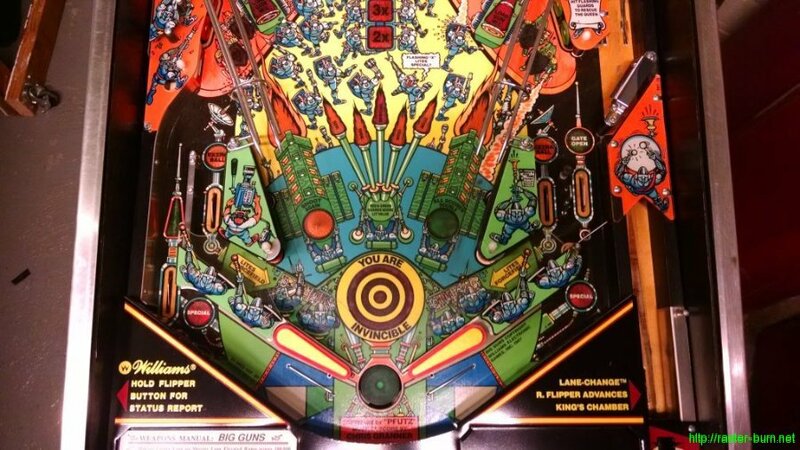 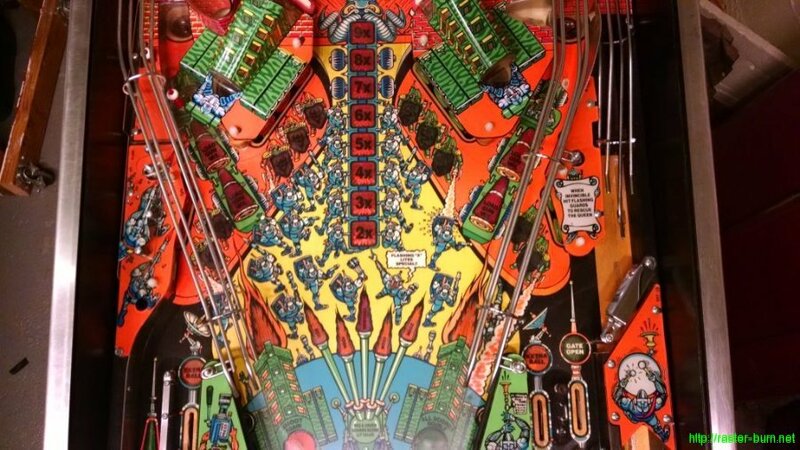 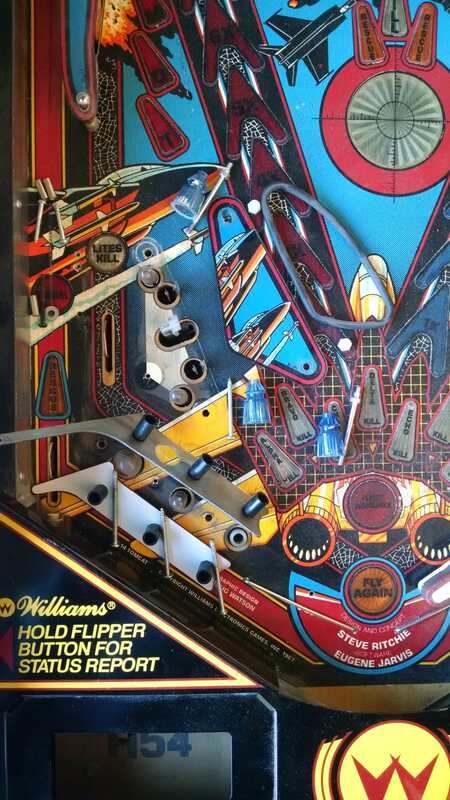 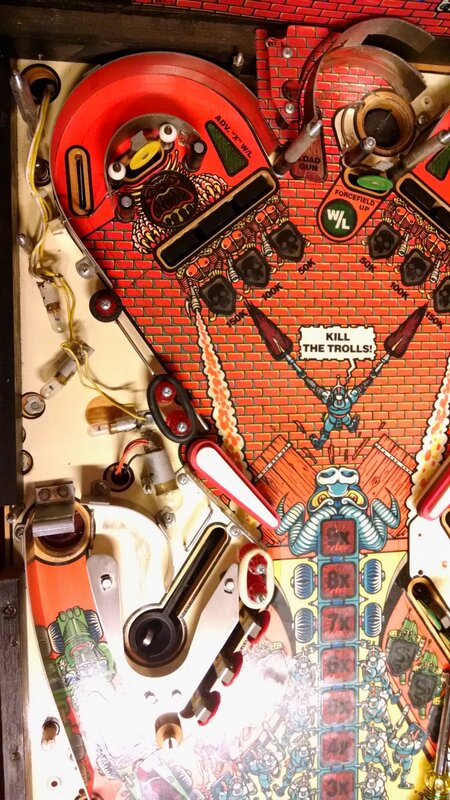 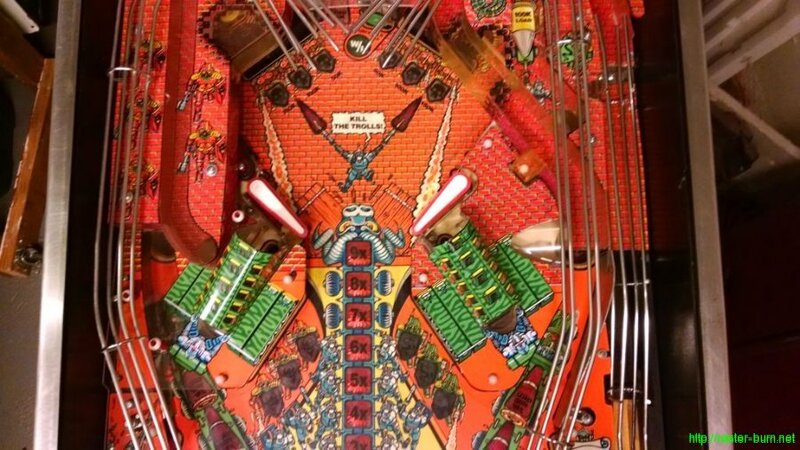 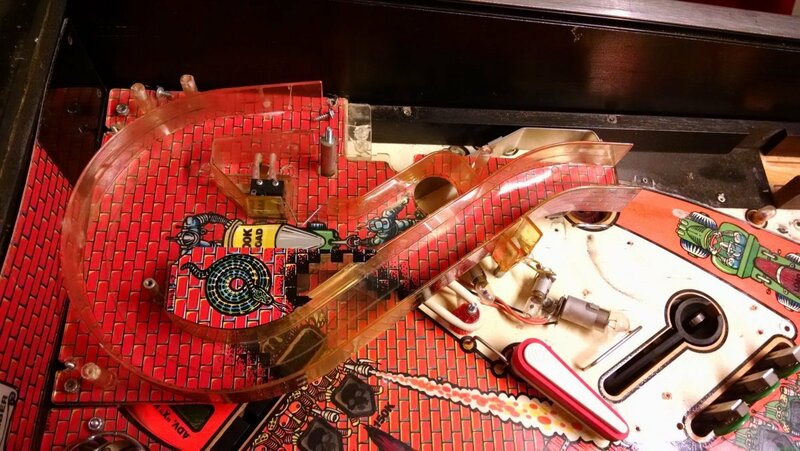 It also had mylar installed over many areas of the playfield when new, which had now been pulled up by the rising inserts and taken up art with it. 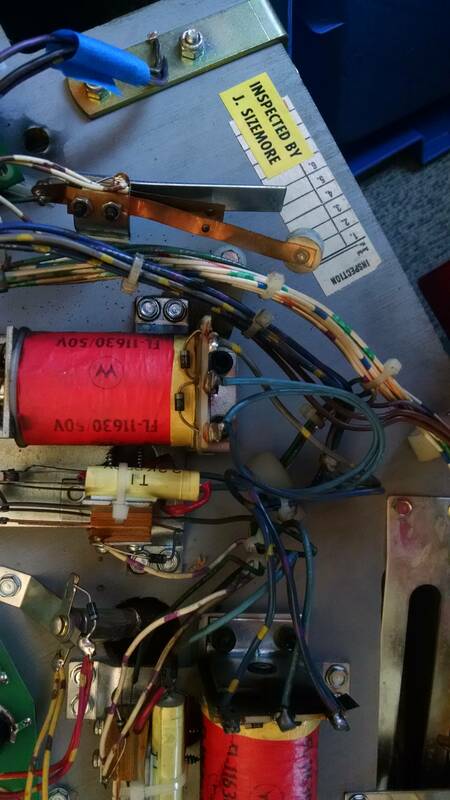 The pictures below are the state I found it in after over a decade in storage. 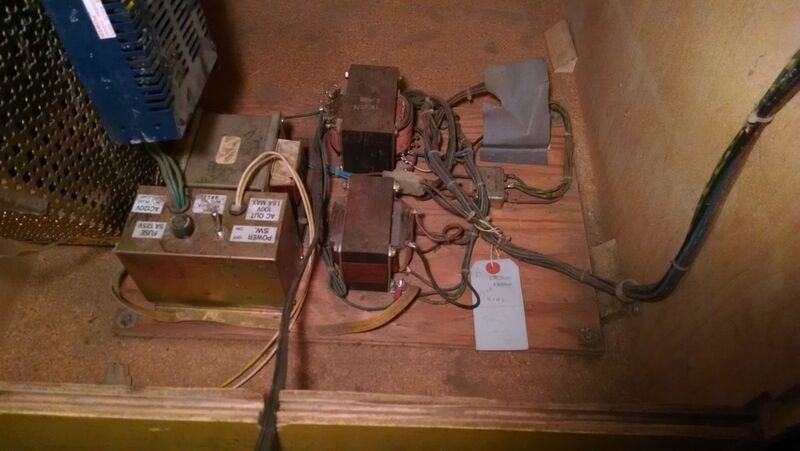 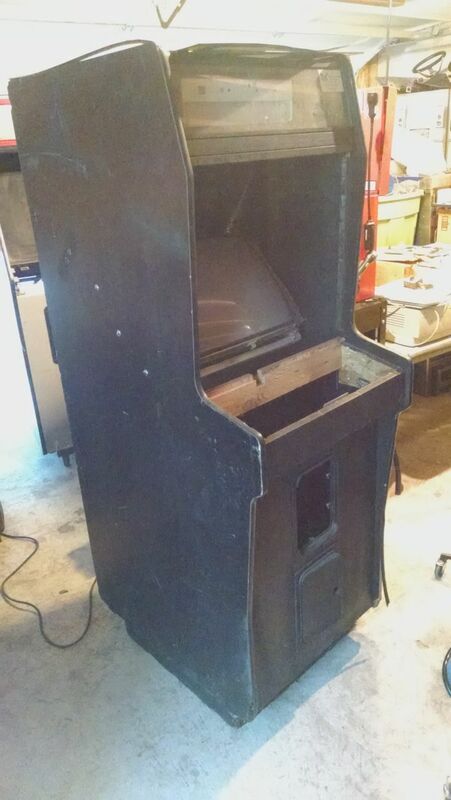 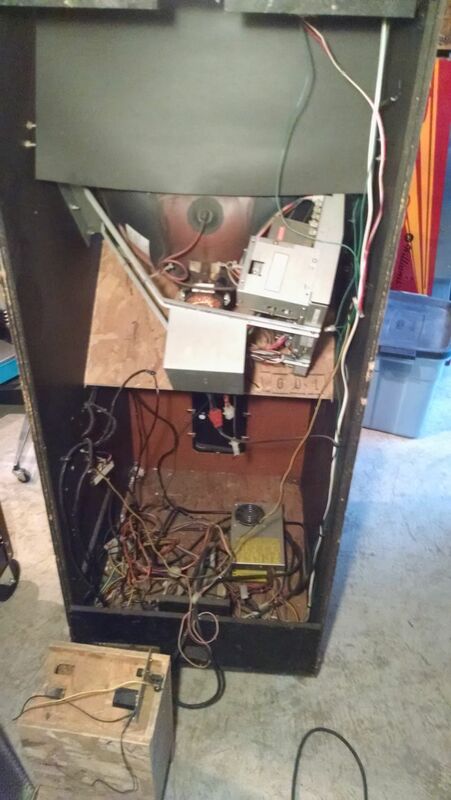 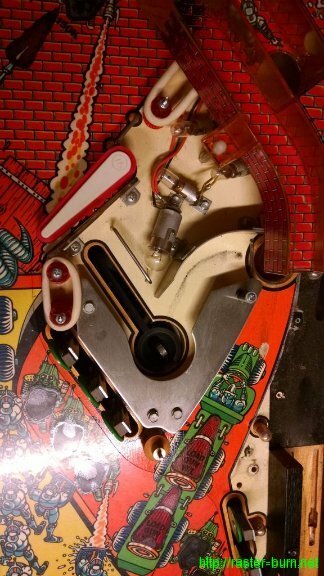 While the playfield was rough, the machine had been stored dry. 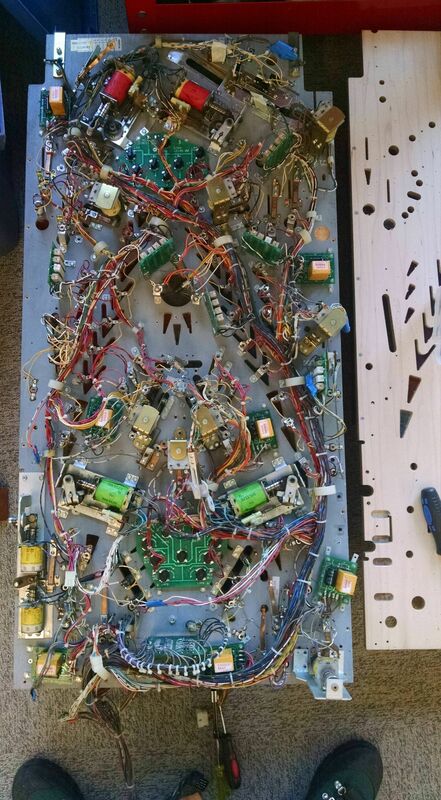 It also didn’t look to have all that many plays on it before it had been laid up in storage. 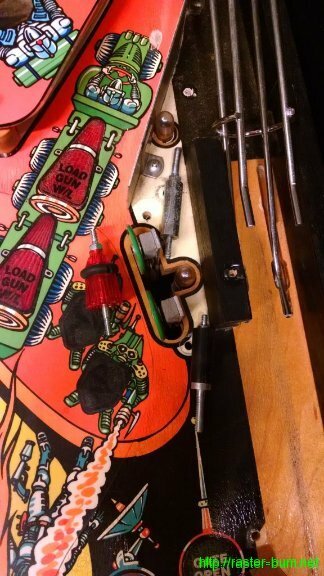 The boards were pretty clean, with no battery leakage, and all of the playfield mechanisms were pretty fresh looking, if dusty. 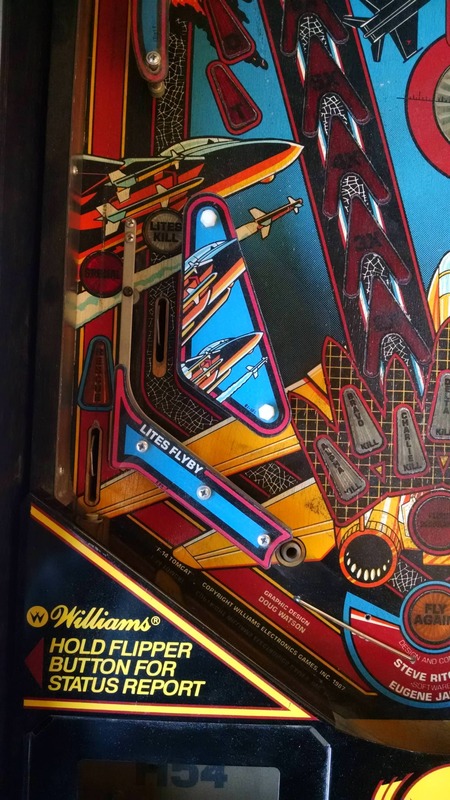 Some time after I took possession of the machine, Buthamburg (AKA Perfect Playfields) announced they would be doing a run of reproduction playfields for F-14 on Pinside. 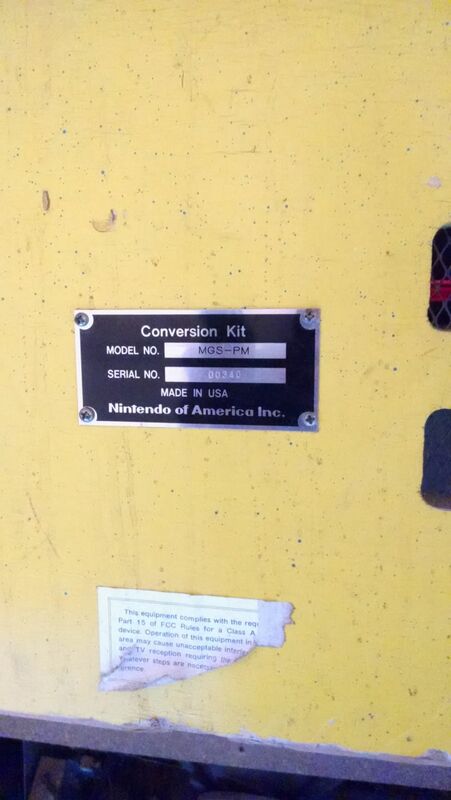 I got myself on the waiting list and after a few months a package from Germany arrived at my office. 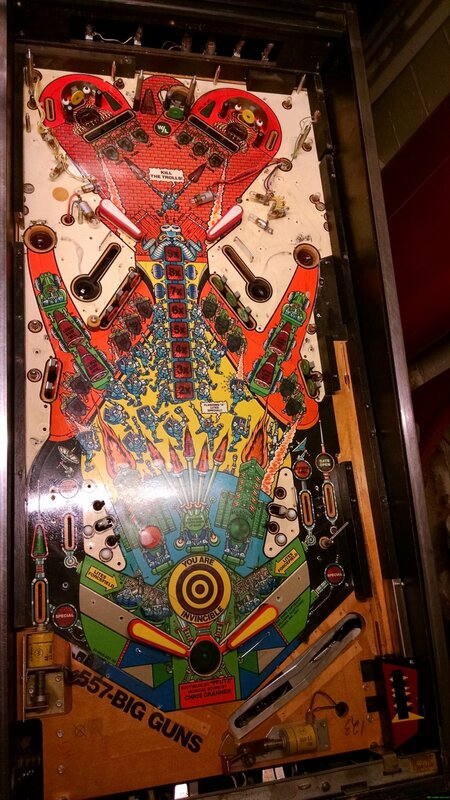 Several months of procrastination later (I’d claim it was to let the clearcoat cure, but I’d be lying) I cracked things open and got the old playfield and new laid out side by side. 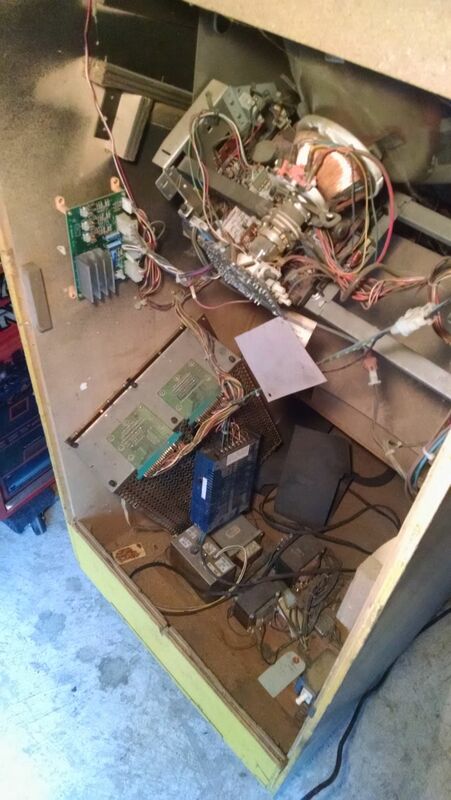 Disassembly was pretty straightforward. 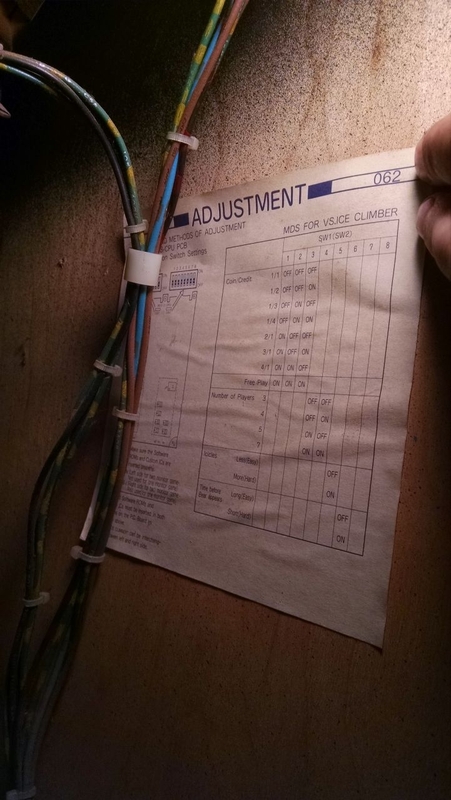 I took pictures of everything I could think to and still ended up with missing information. 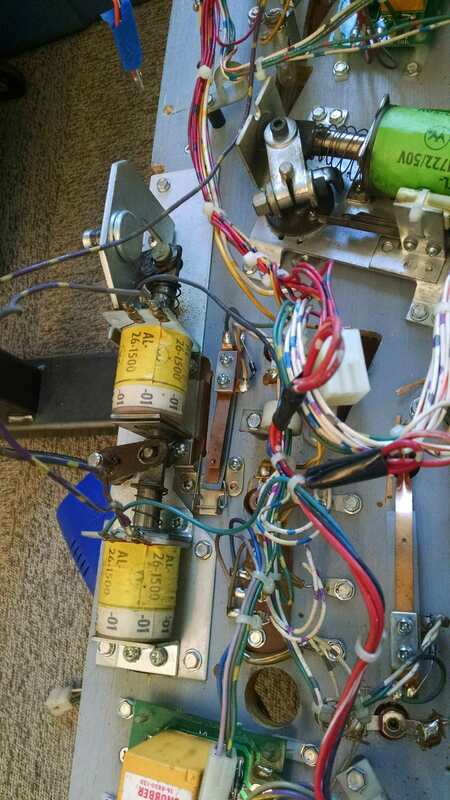 Next time I plan to take a few slow pan videos over the entire thing to get a more complete documentation of part placement and wire routing. 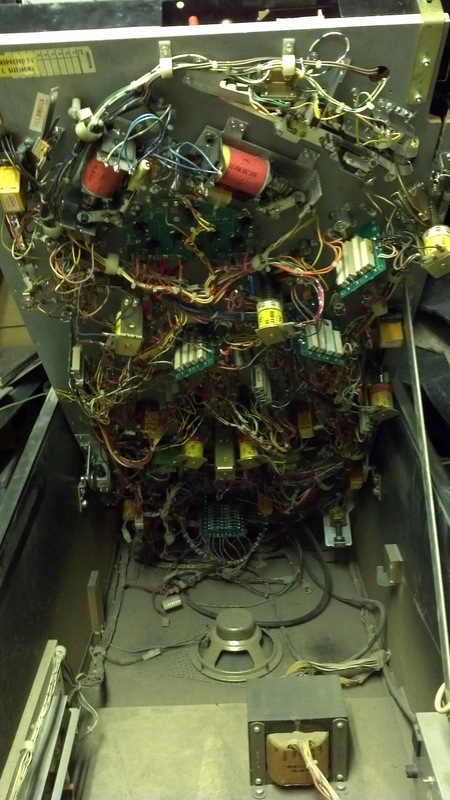 The full gallery of pre-disassembly pictures can be found below (right click and open in new tab to view full resolution). 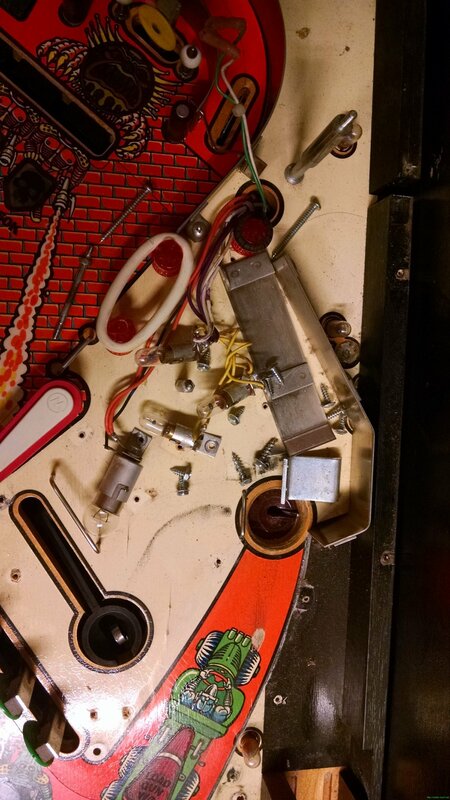 It took a while but I eventually got everything swapped over… While I kept the original incandescent flashers, I swapped all of the smaller bulbs over to warm white frosted non-ghosting LEDs from pinballbulbs.com, with a couple colored ones for the spots where an incandescent bulb would have had a color gel sleeve over it. 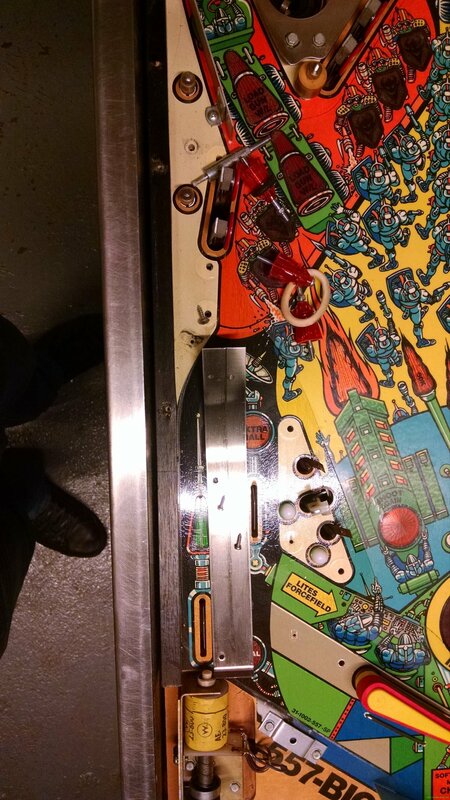 I’ve been very satisfied with the results, though I’ve heard sunlight spectrum LEDs offer an even closer look to the original incandescent glow and plan to try them out on my next shop out. 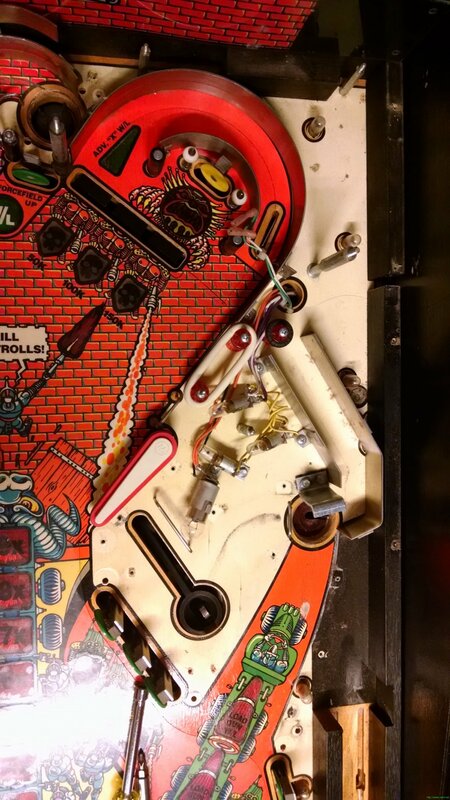 There were only two major issues I encountered after re-assembly. 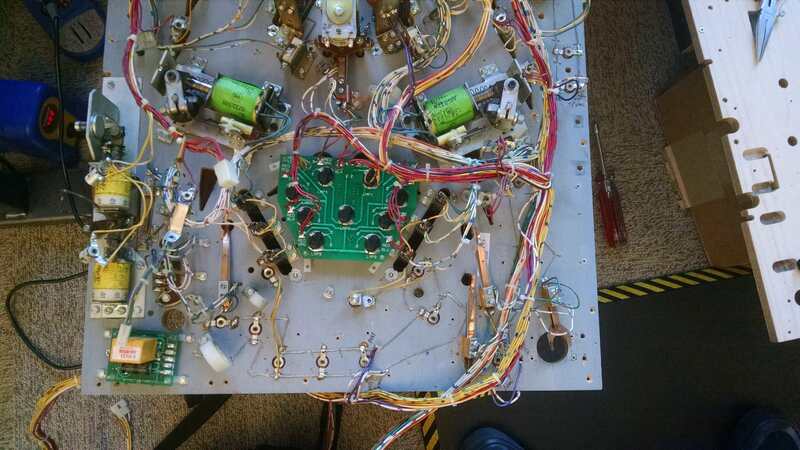 The first was due to my decision to re-install the factory ground braid for several segments of the lighting. 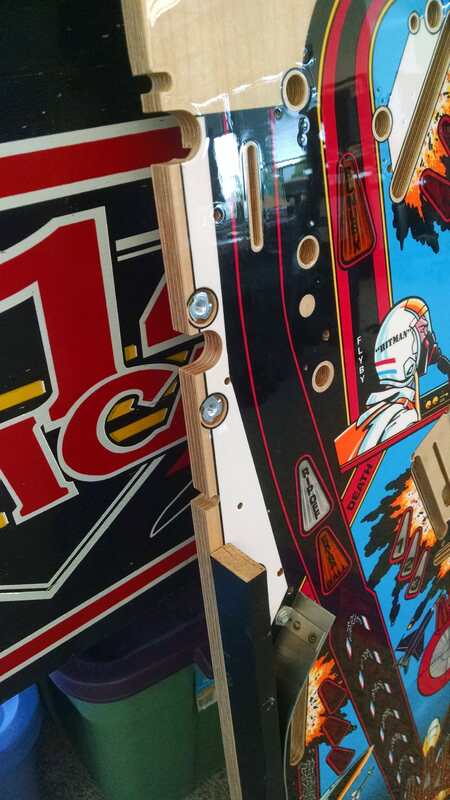 I picked up an electric staple gun to re-install it on the new playfield and found it did not have enough strength to drive the staples into the hard plywood. 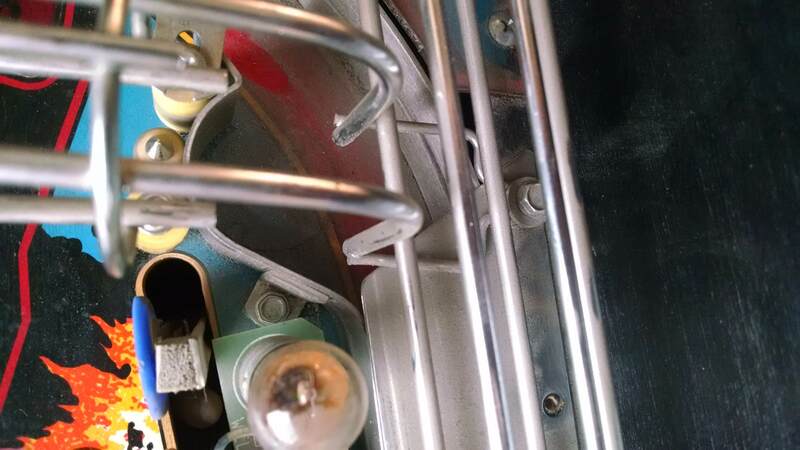 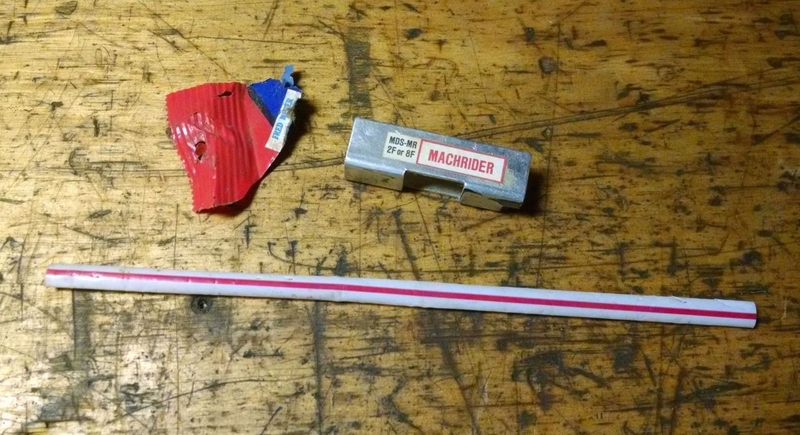 Worse than that though, was I ended up not being careful enough with the staples holding in the lamp sockets, and ended up with a few cases where a staple leg created a short to the barrel of the socket, resulting in blown GI fuses. 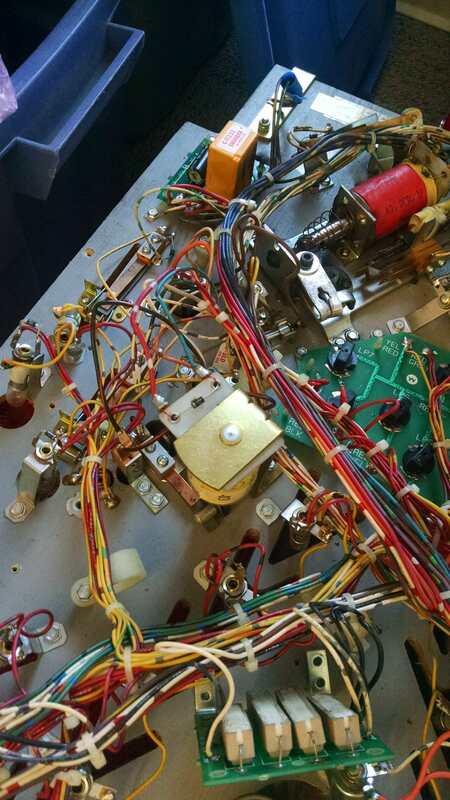 After that experience I wouldn’t re-use the braid again, nor use staples to install the sockets. 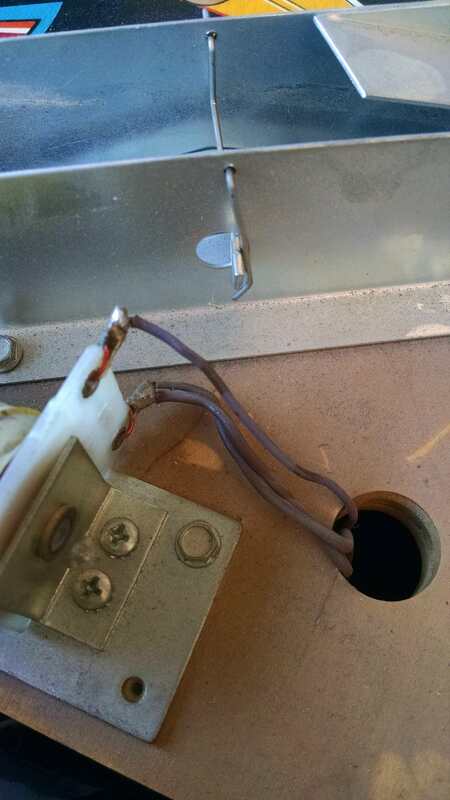 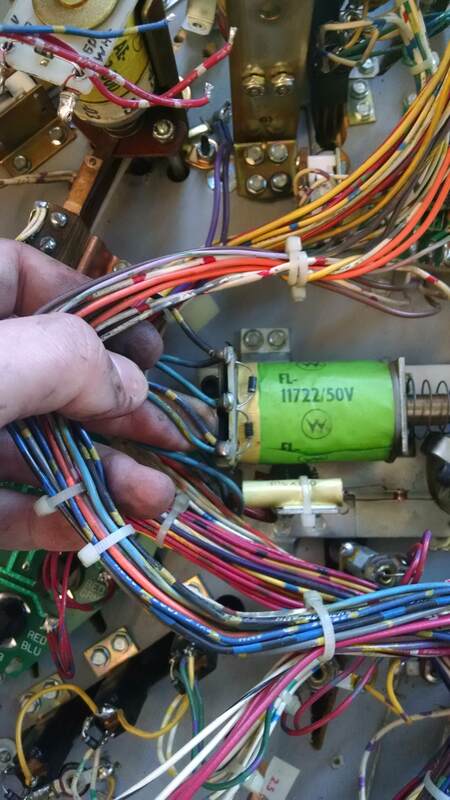 Instead the next swap will include switching to the piggy back grounding with insulated wire used in other areas of the machine. 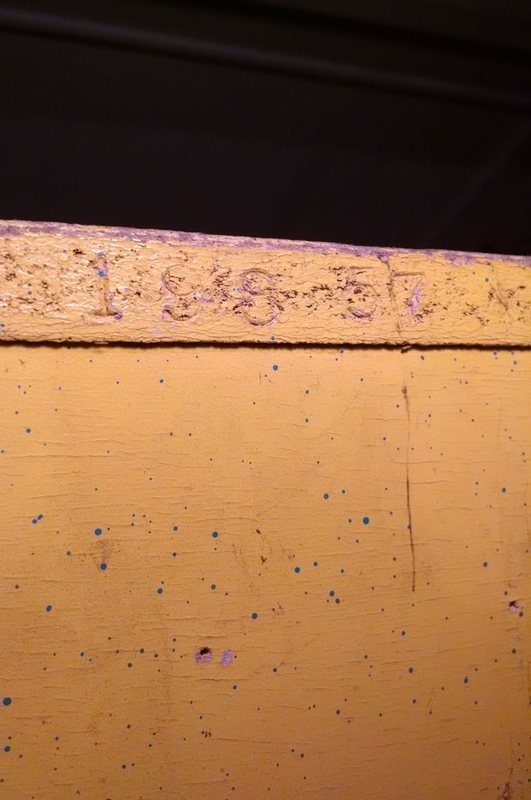 Were I doing a detailed restoration where using factory style braid was non-optional, I’d find a pneumatic staple gun to do the job with less frustration. 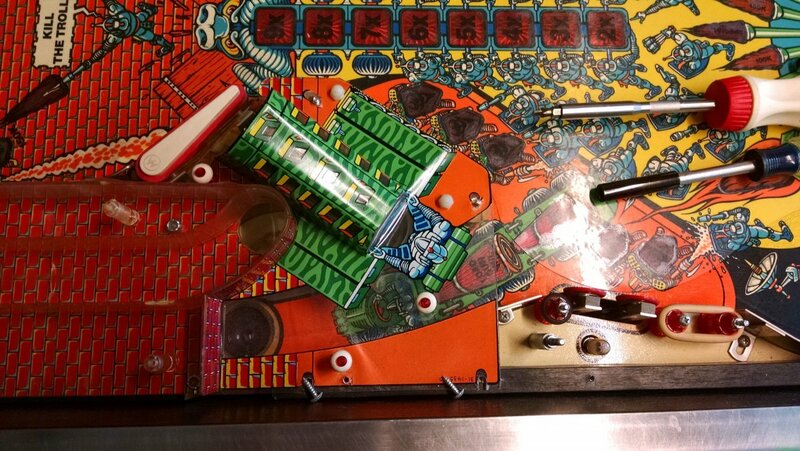 Regardless of the fasteners used, I’ll also be careful to continuity test a bit more extensively prior to first power up. 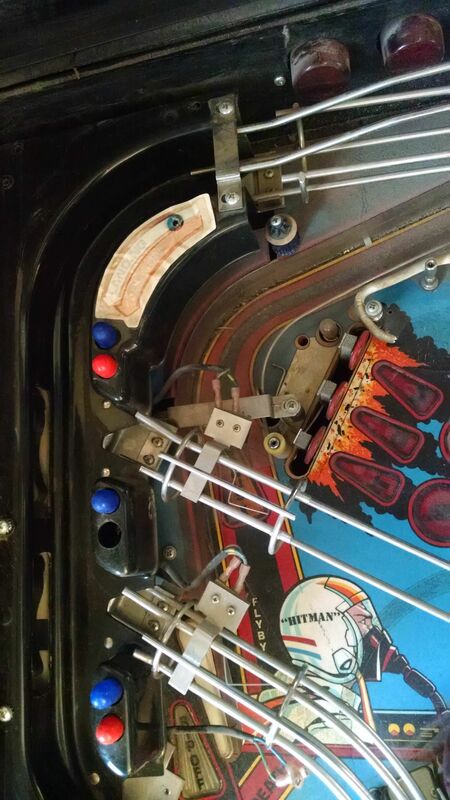 The second issue was a mysterious and very consistent air ball problem on ball launch. 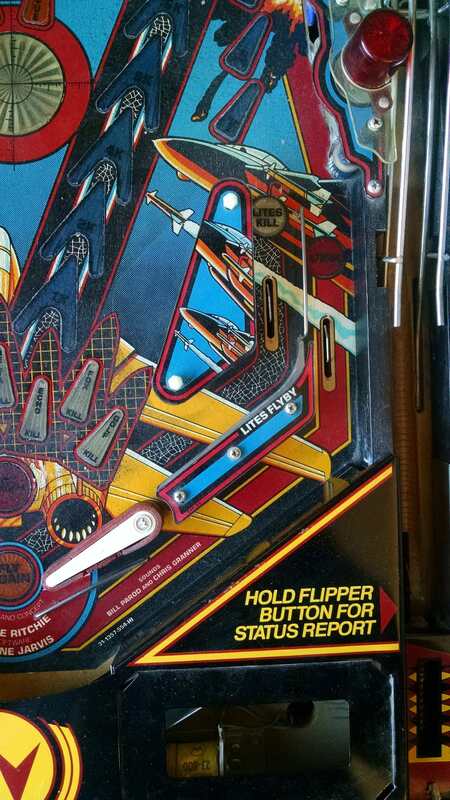 When you’d plunge a ball it would come flying out of the shooter lane and smack the glass much of the time, and even if it got going up the ramp would often not have enough velocity to make the orbit and enter play. 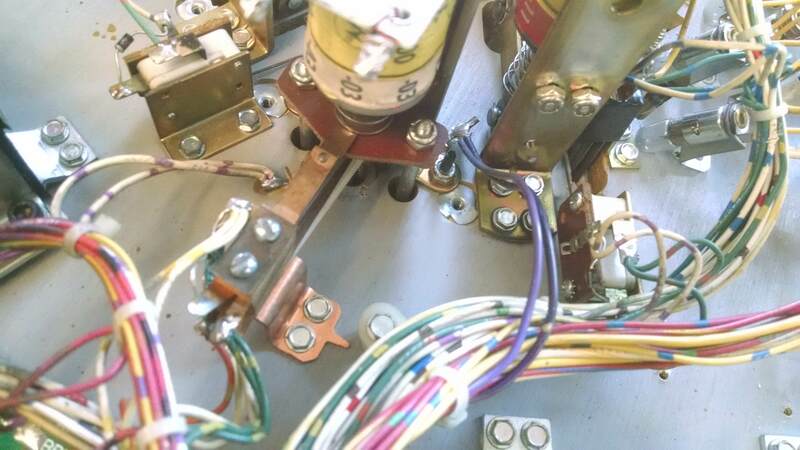 I initially thought this was a wireform ramp alignment issue, and spent too long chasing that red herring… Ultimately though, it ended up being a problem of the alignment of the plunger assembly itself. 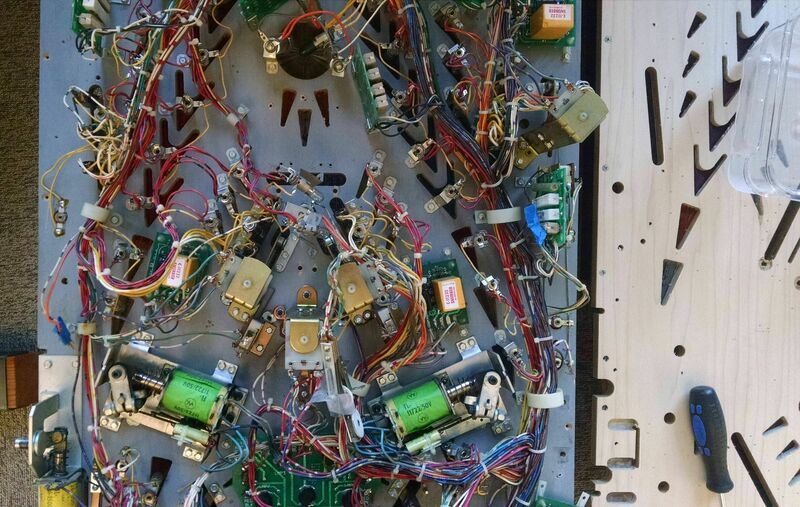 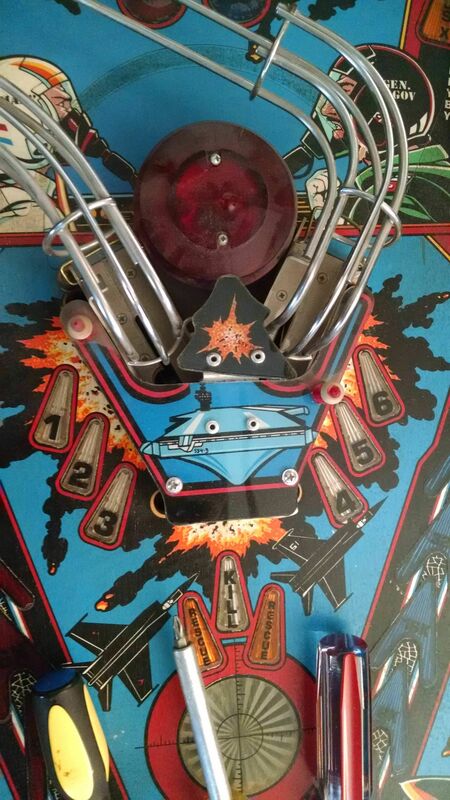 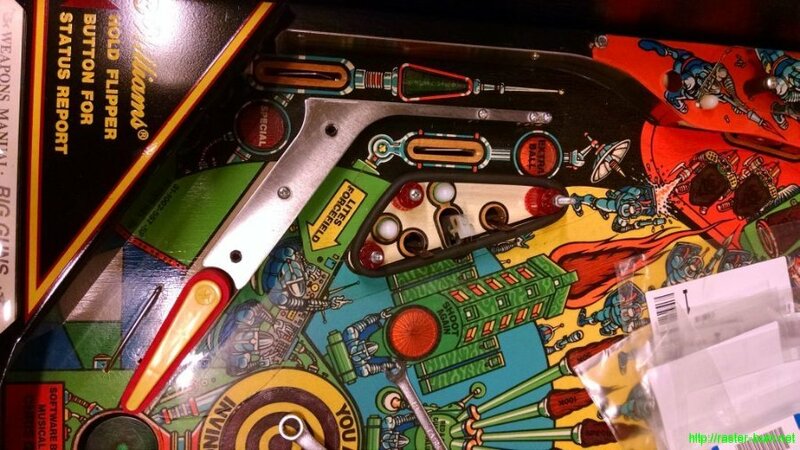 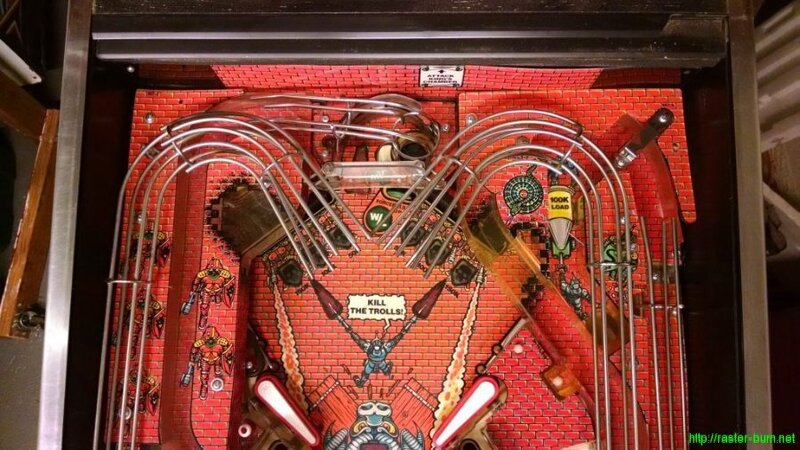 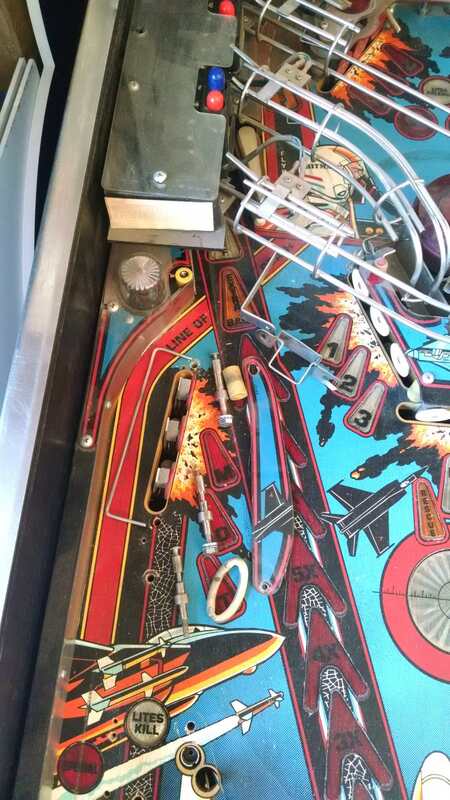 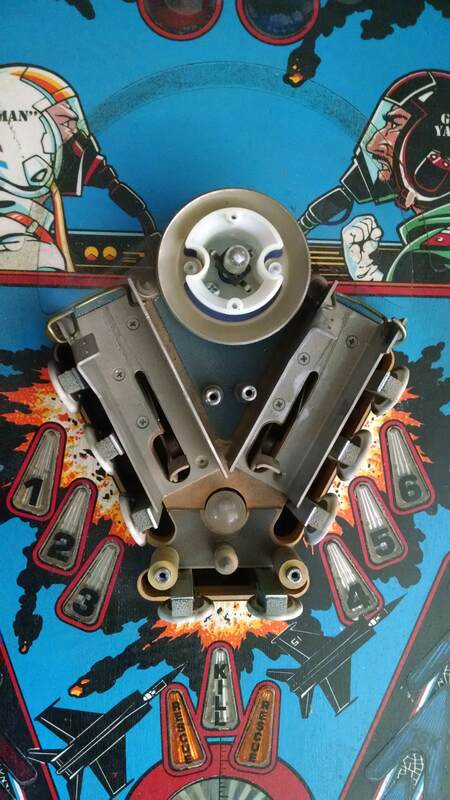 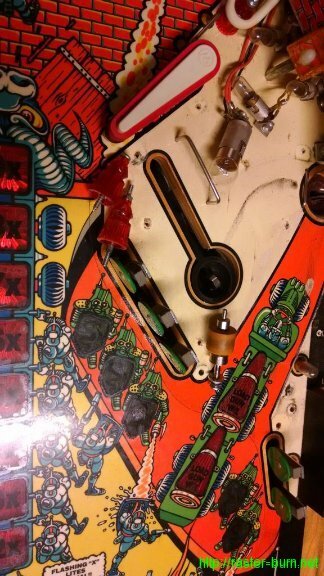 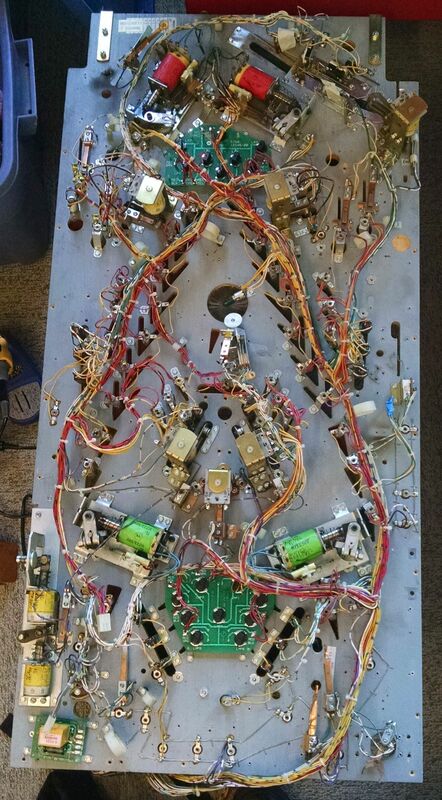 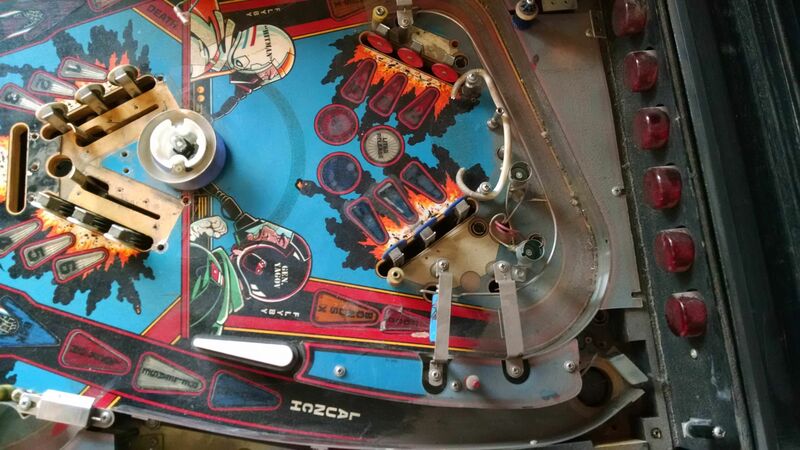 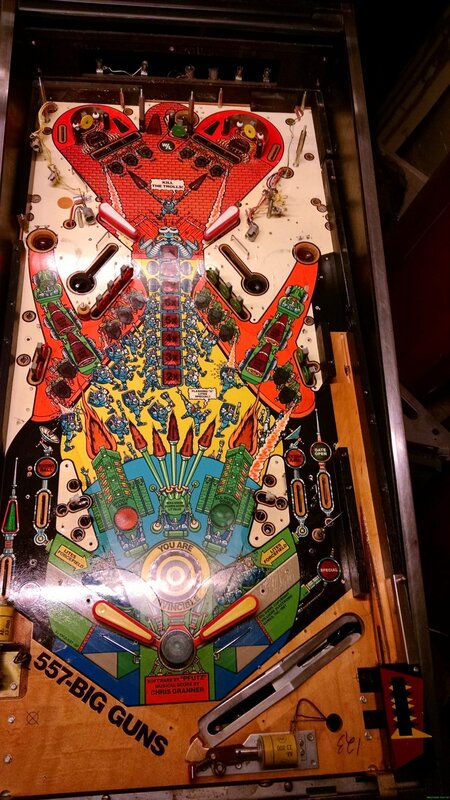 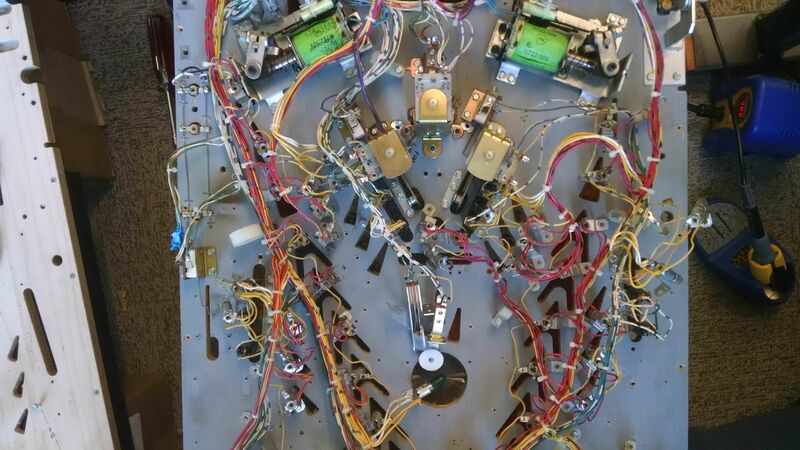 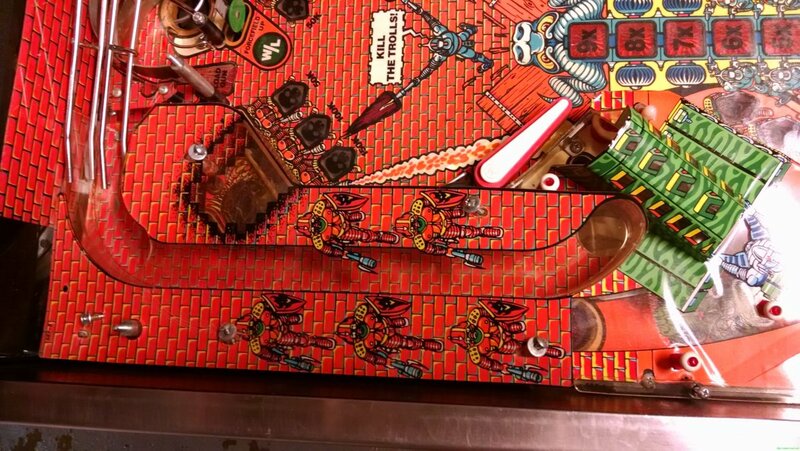 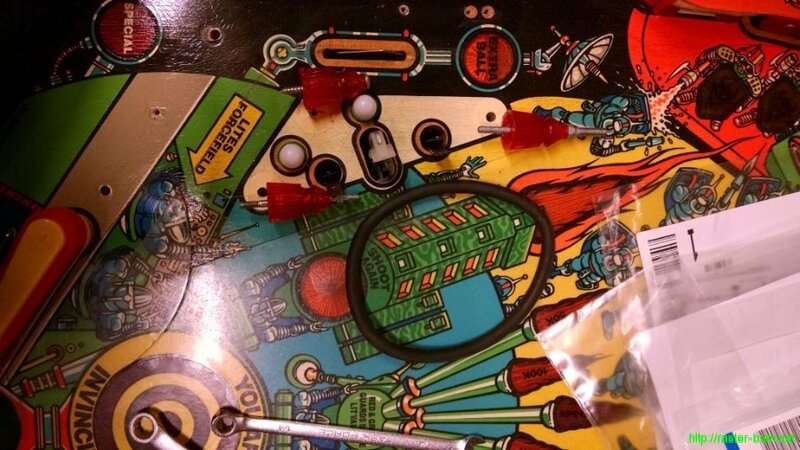 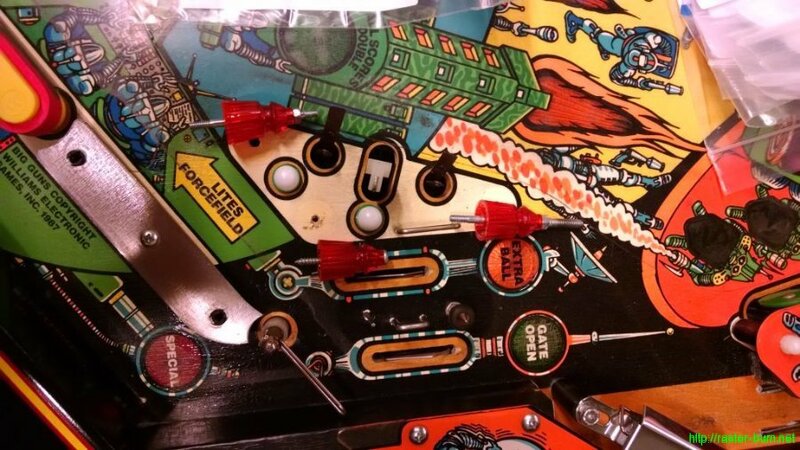 You can see in the above picture the outline of the assembly’s placement with the original playfield, and just how far I had to move it over to get the plunger centered with the lane of the new playfield. 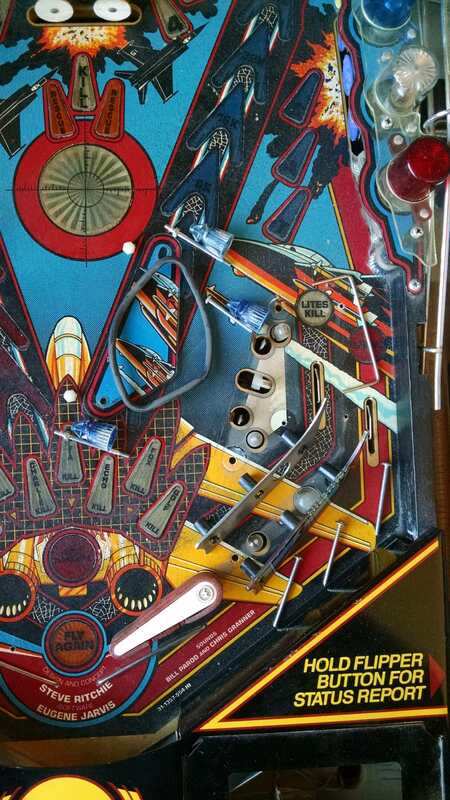 Following that adjustment, my air ball problems went away entirely. 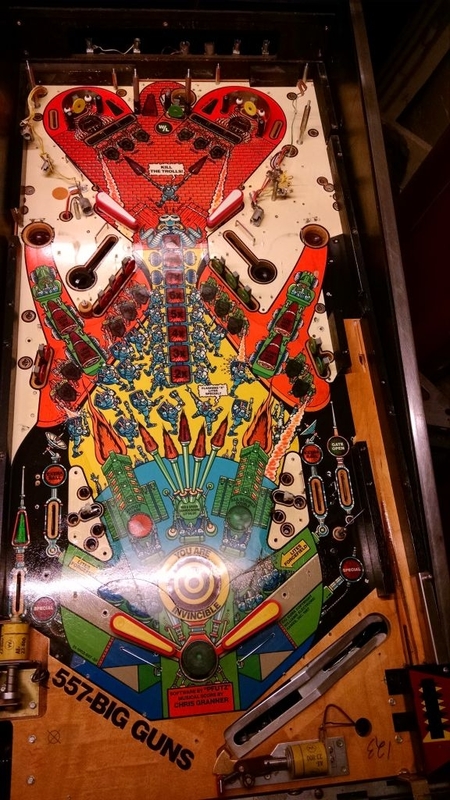 It’s now half a year, several thousand plays, and a visit to the Portland Retro Gaming Expo later, and so far the machine has played beautifully and largely problem free after the initial shakedown period. 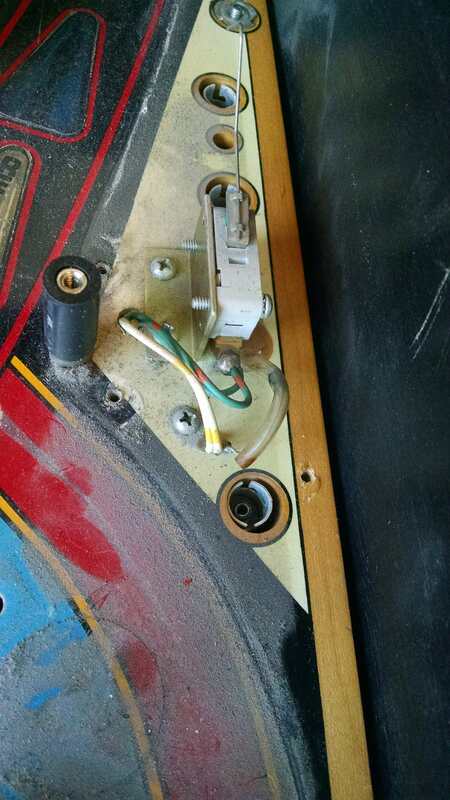 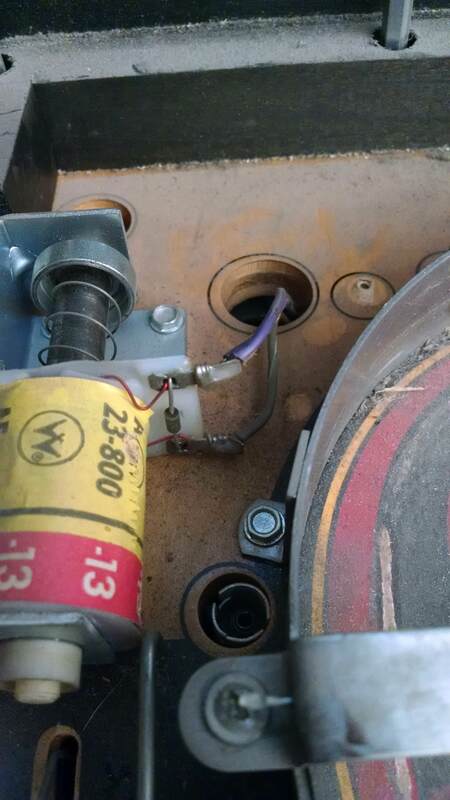 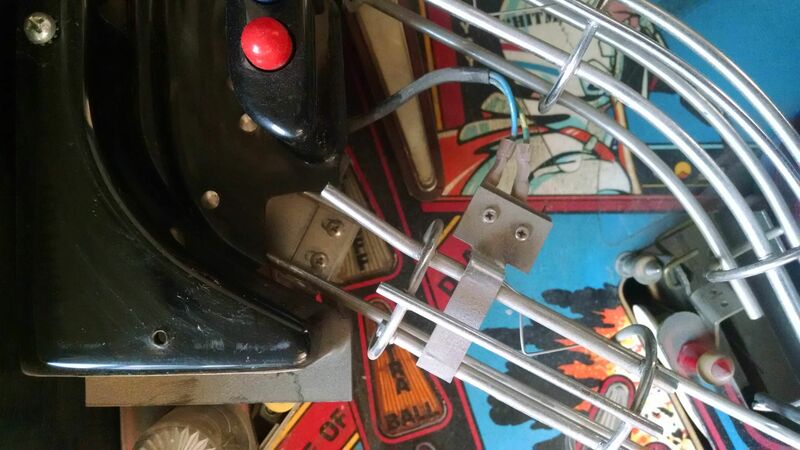 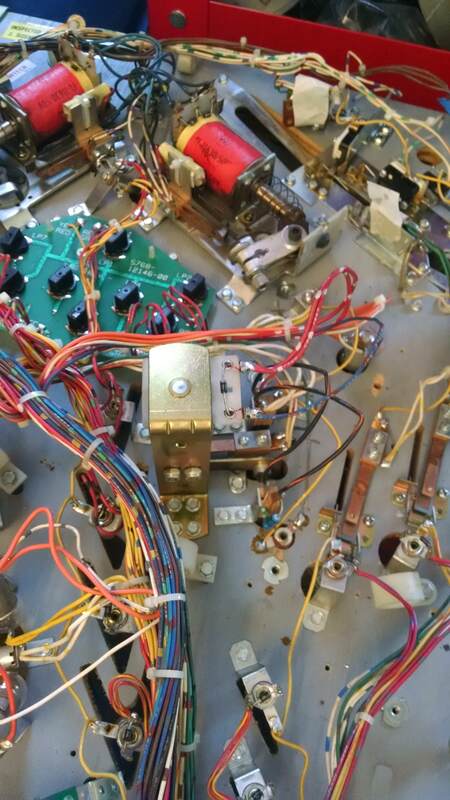 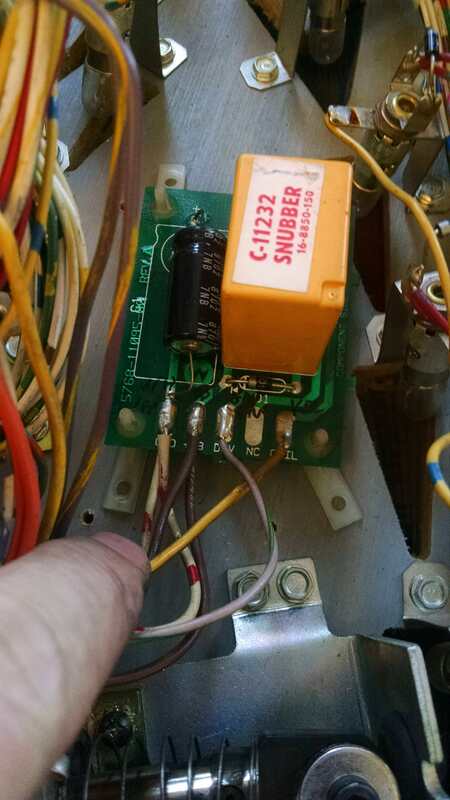 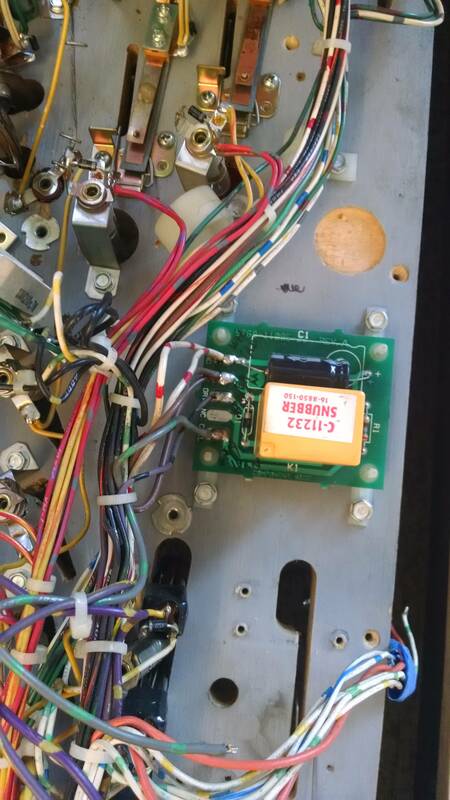 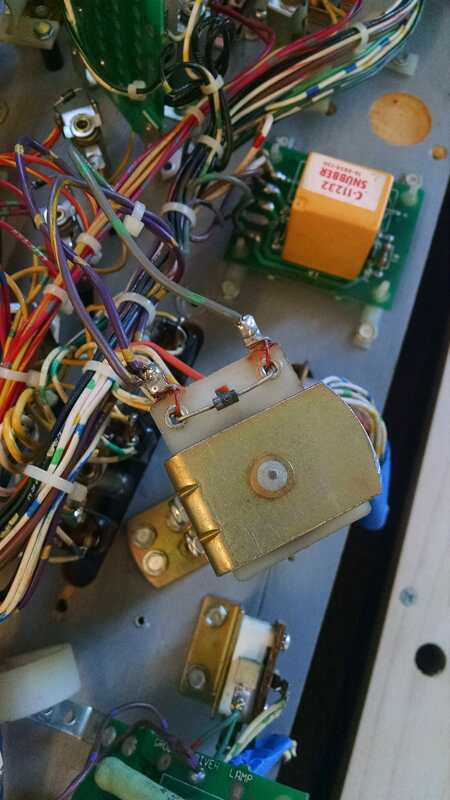 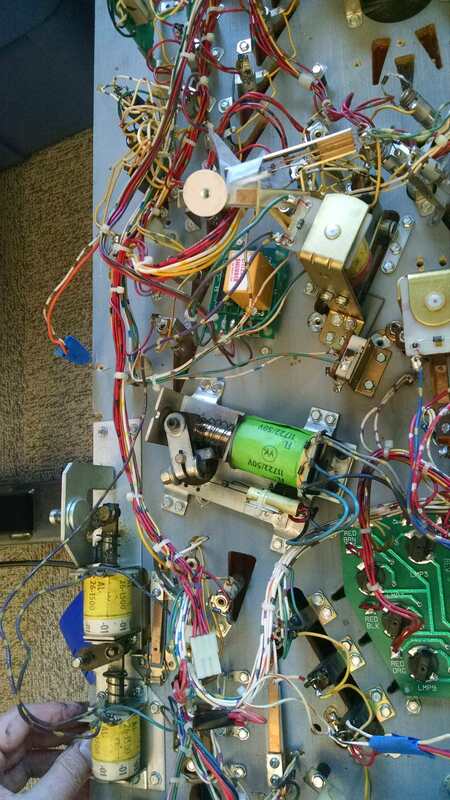 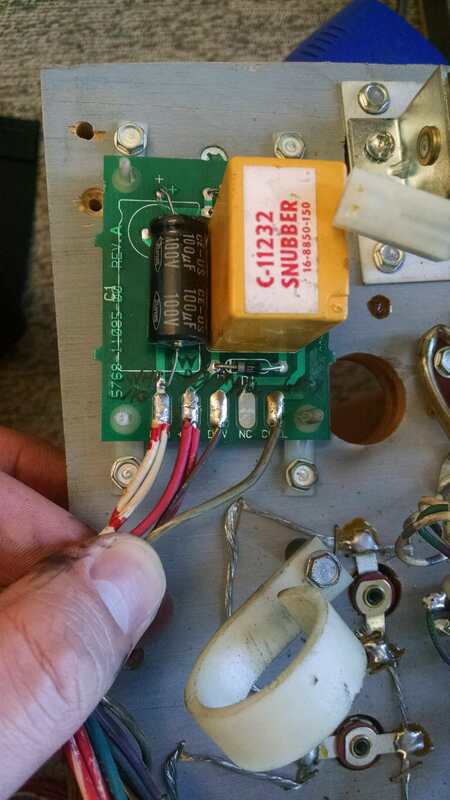 Besides the issues noted above all I’ve had to deal with has been an occasional playfield element connection broken due to fatigue. 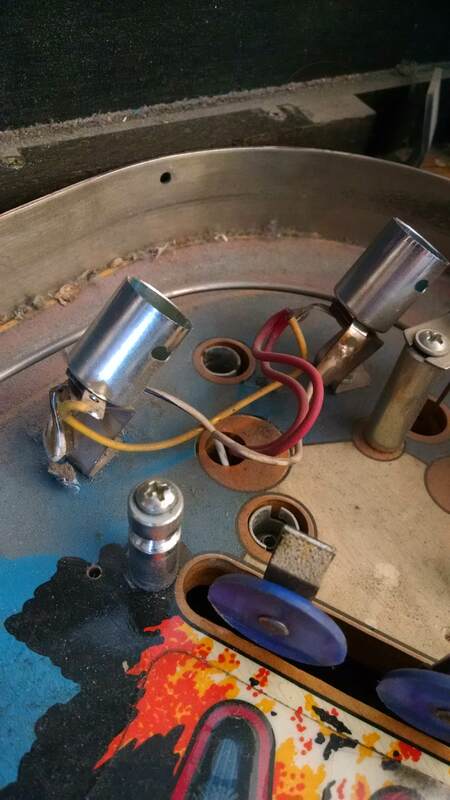 I have seen the development of the dimpling due to ball impacts that is common to new clear coated playfields. 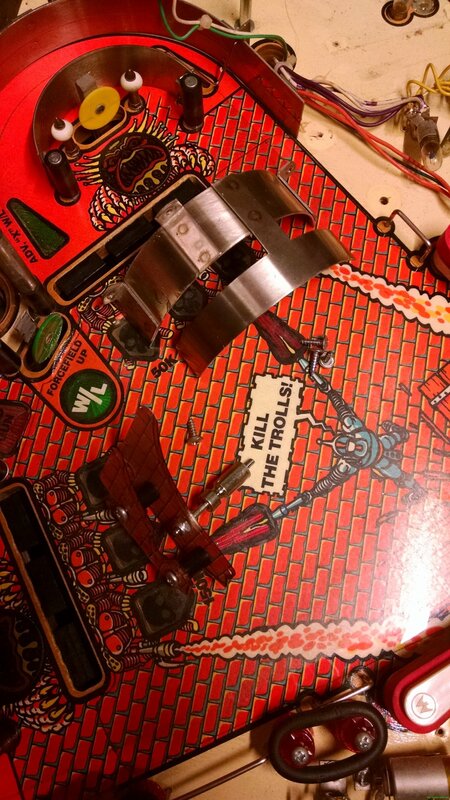 I won’t be worrying about it too much as the game plays quite smoothly and I haven’t seen any actual finish loss, only what I’d consider normal wear, but it’s worth noting for those it bothers. 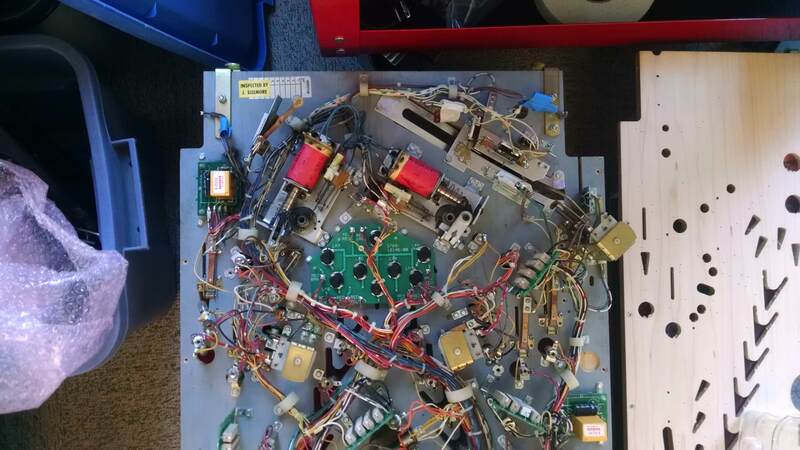 You can view the rest of the post-swap pictures of the machine below (right click and open in new tab to view full resolution). 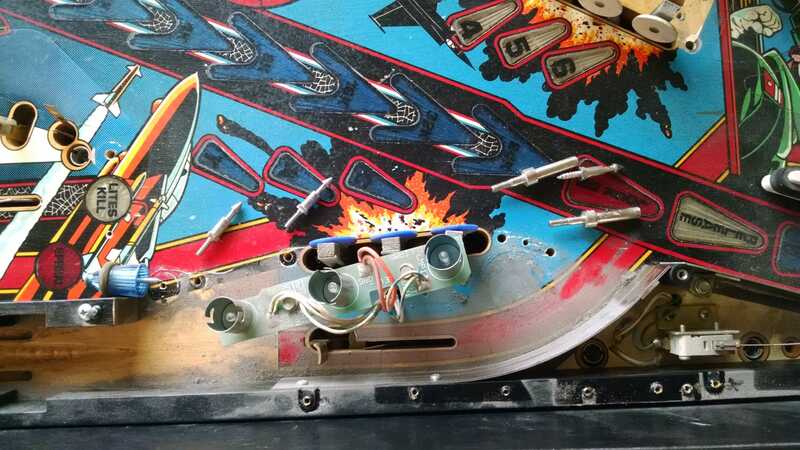 A thread full of others’ experiences with swapping in this particular run of reproduction playfields can also be found on Pinside here. 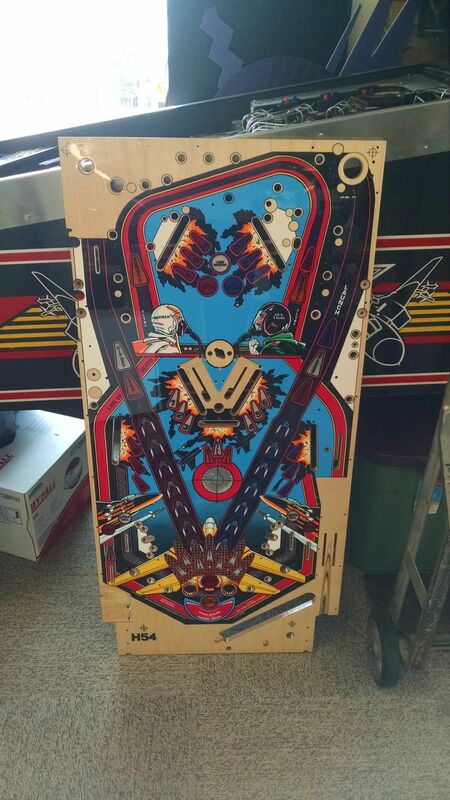 …took about 3.5 hours over two sessions. 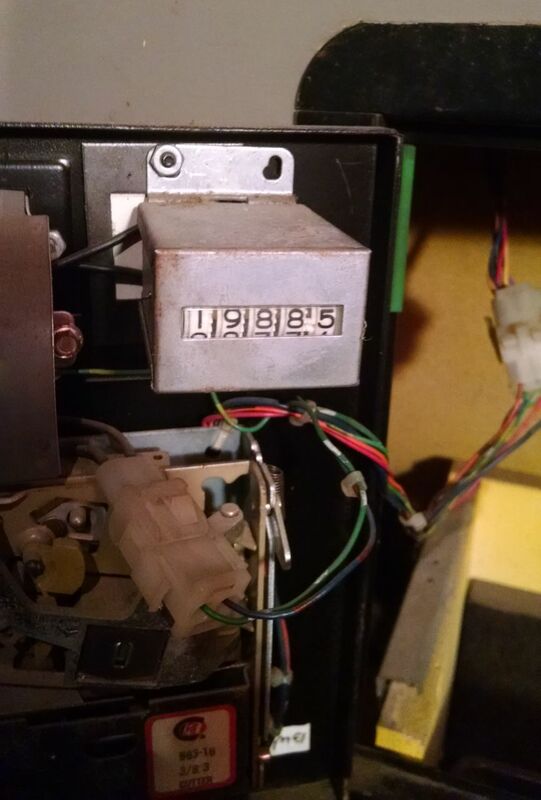 Or, to put it in relative terms, about a third of the time I put into Sorcerer, and even more favorable compared to Comet… Though I can’t say exactly how much better since I didn’t keep time for that one. 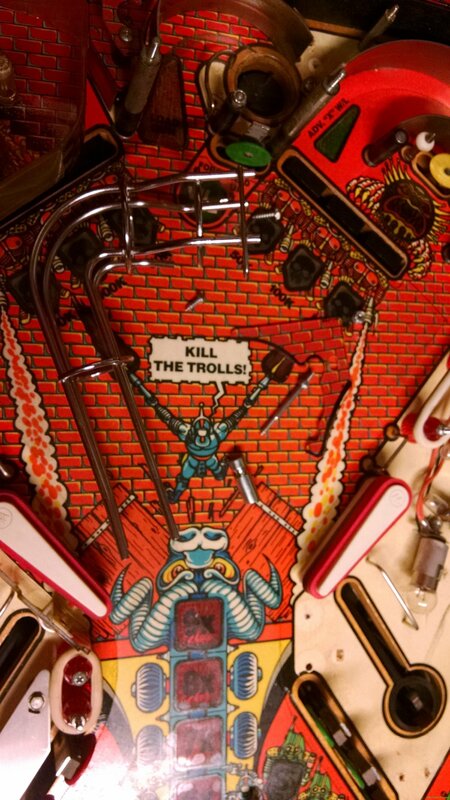 I’m very pleased with how streamlined my workflow is becoming. 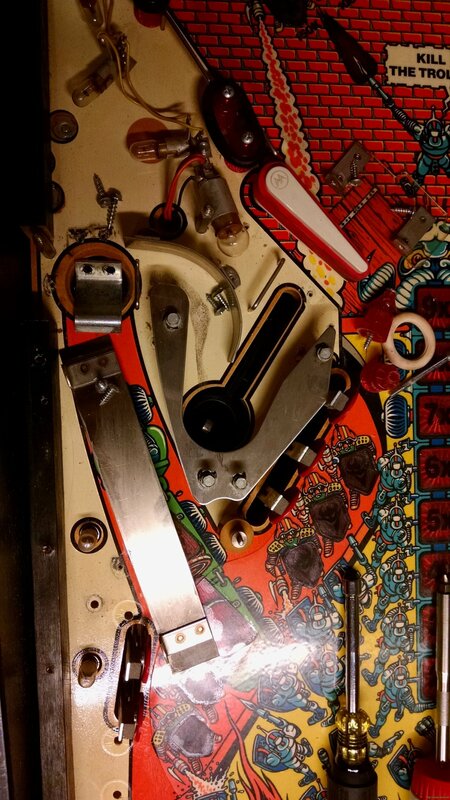 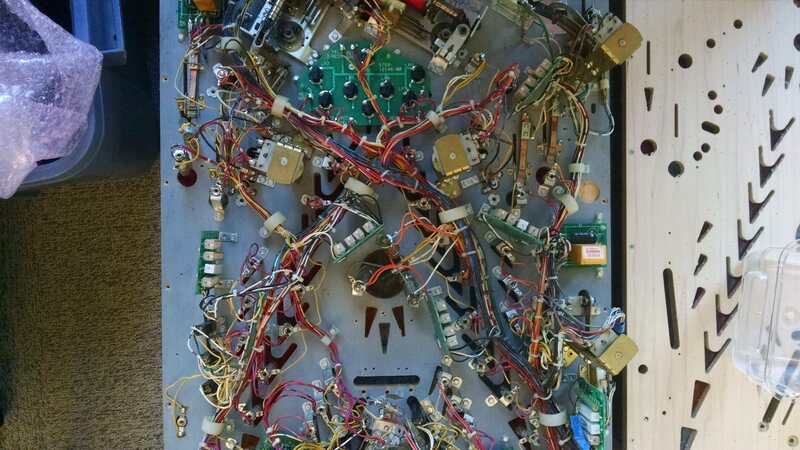 During disassembly I basically break the playfield into a 2×8 grid and work my way through each section, photograph it, remove parts in logical (to me, at least) groupings, and bag and label each subassembly. 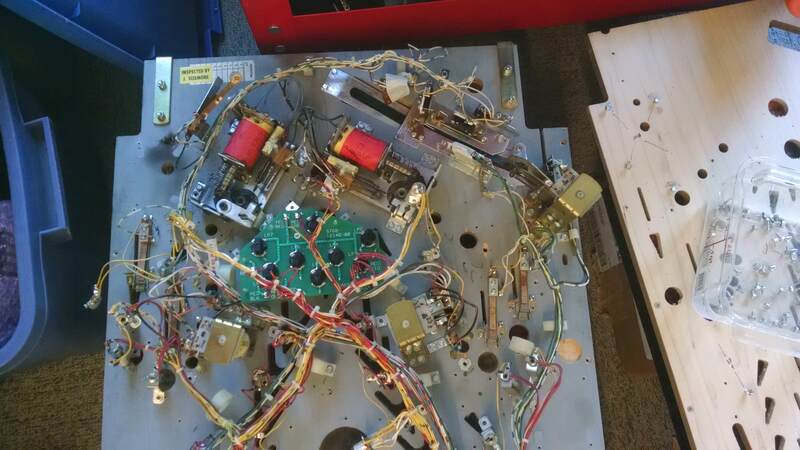 I found that the most time consuming part of reassembly on the previous two tables was filling in the blanks where I hadn’t done enough documentation during teardown. 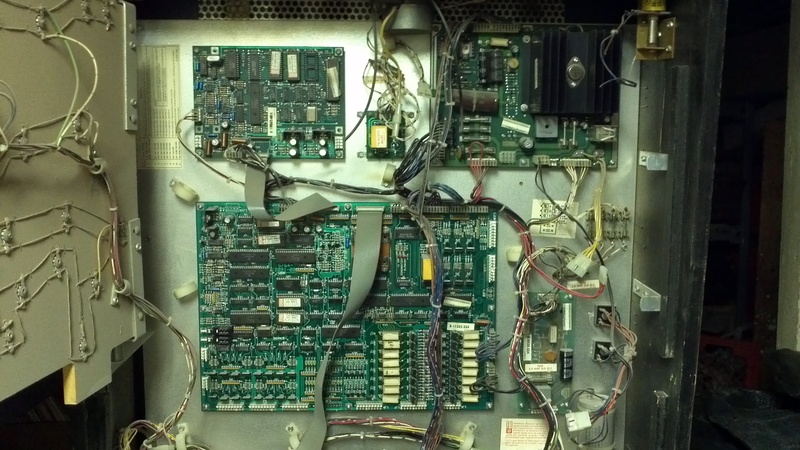 Being extra methodical with breaking this one down saved me a ton of time in recomposing it, despite the significant increase in complexity from System 9 pins like Comet and Sorcerer to the more feature laden System 11 based Big Guns. 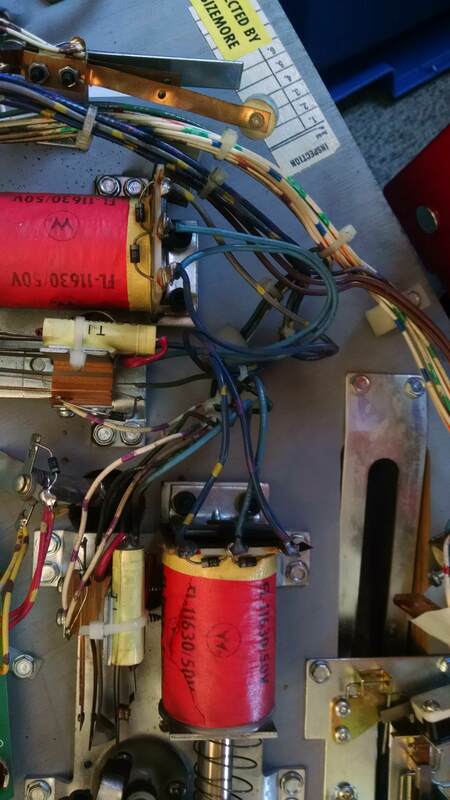 Given there are 2-4 layers of parts to remove to get to any given bulb, I wasn’t thrilled at the prospect of having to tear things down to get to short-lived incandescents, so I decided to go the LED route. 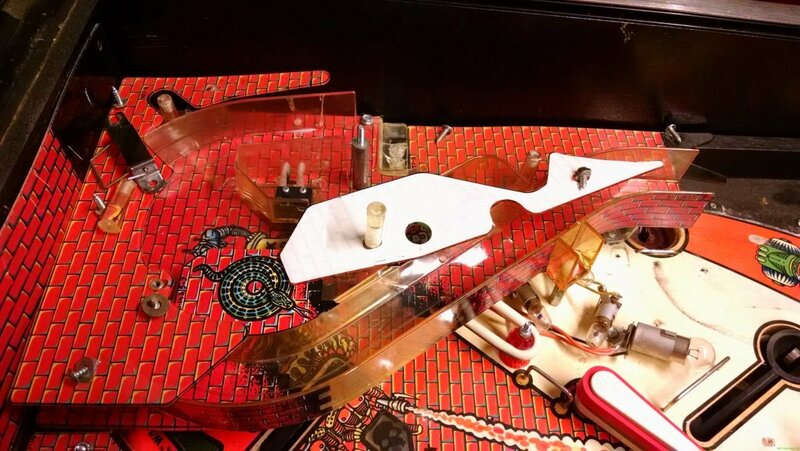 I used Pinballbulbs.com non-ghosting LEDs in warm white for the #44 general illumination and cool white for the #89 flasher bulbs on the top of the playfield and in the area behind the ‘wall’ at the back. 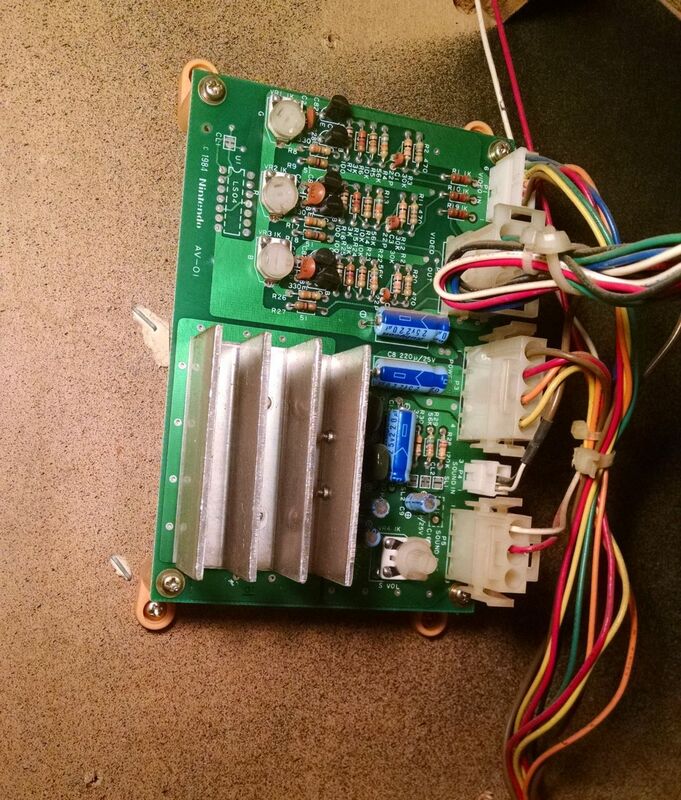 I think the results look pretty nice. 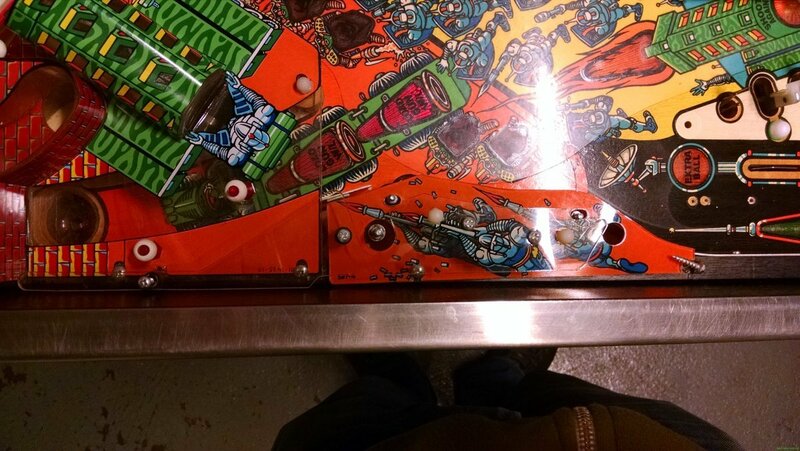 The photo makes it look like a lot of the plastics are blown out by the brightness of the LED bulbs but in person they have a nice bright, even light behind them that shows off the art and lights up the playfield nicely without being overpowering. 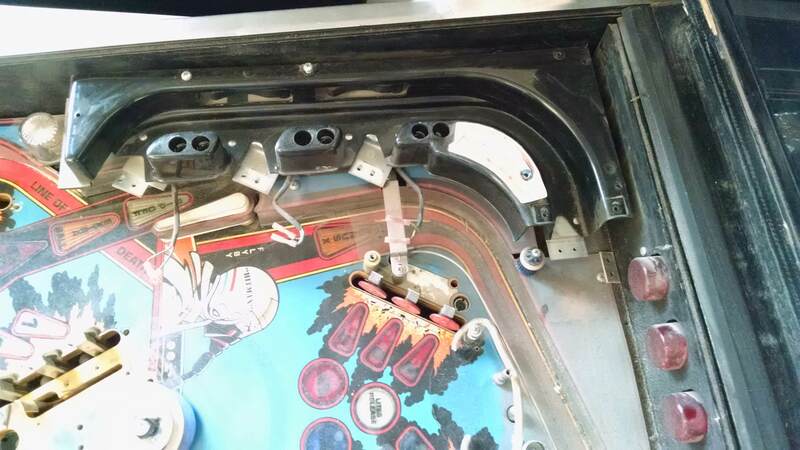 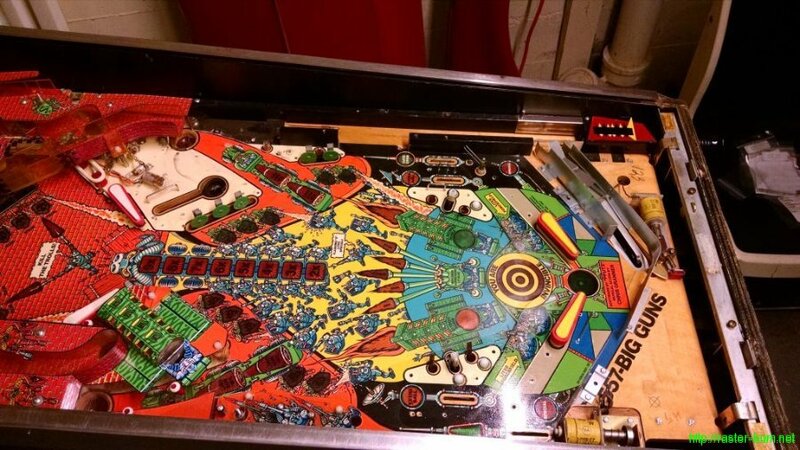 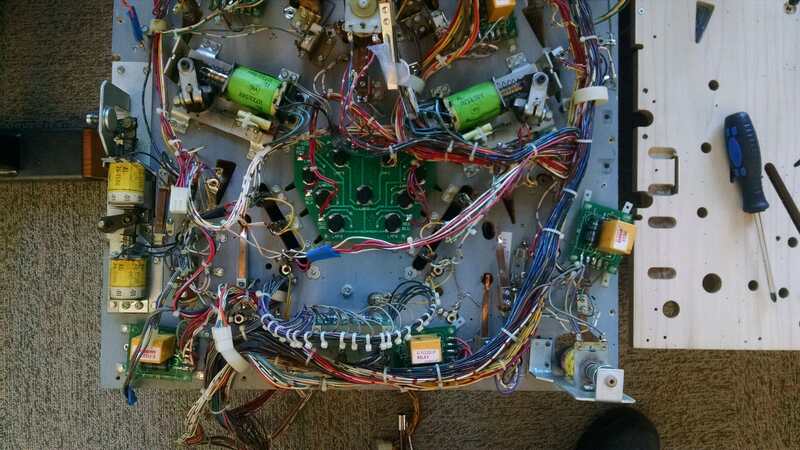 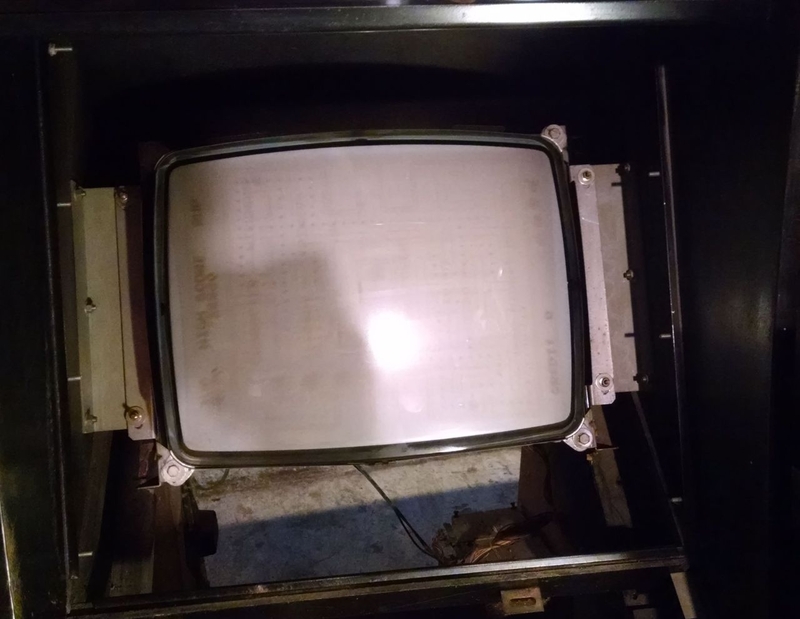 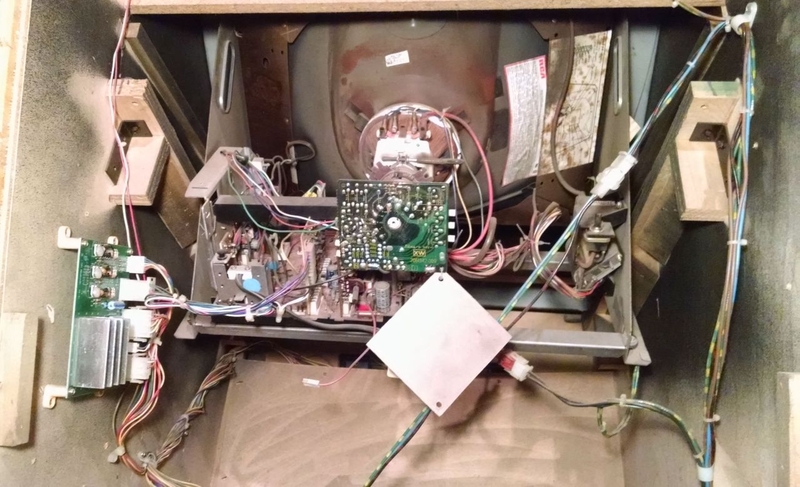 After seeing how the top of the playfield looks I’m going to go forward with replacing the lamps under the inserts on the bottom of the playfield, and replace the lamps in the backbox as well. 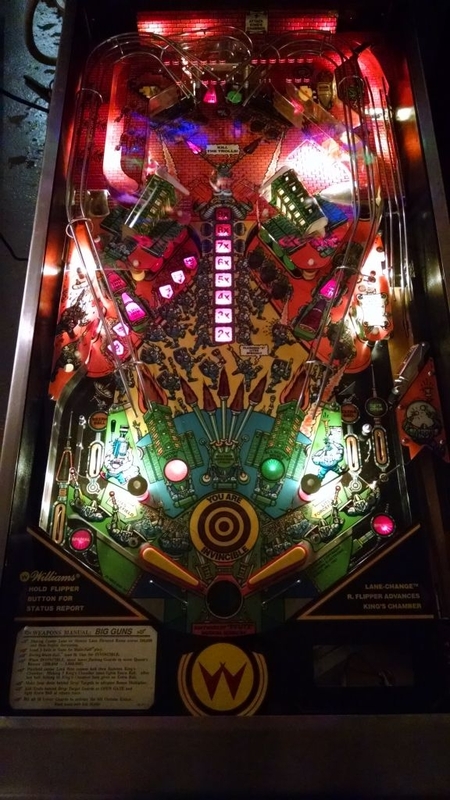 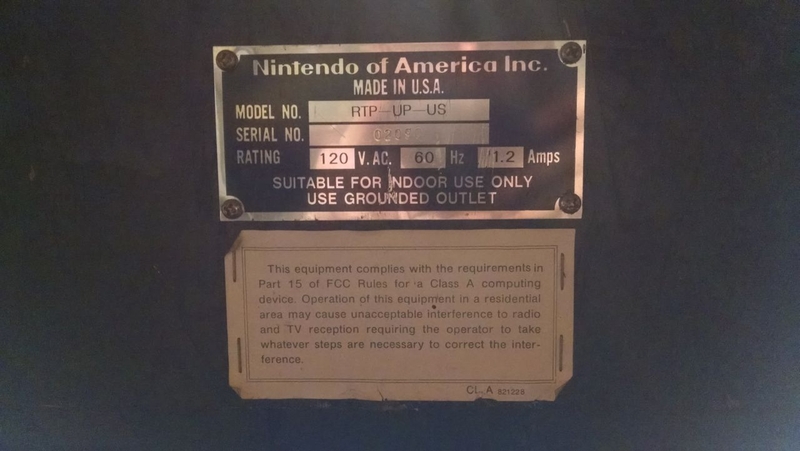 The previous owner installed a color ‘coordinated’ LED kit in the backbox and it makes the art look really bad, since the color of the LEDs completely overpowers the translite’s coloration. 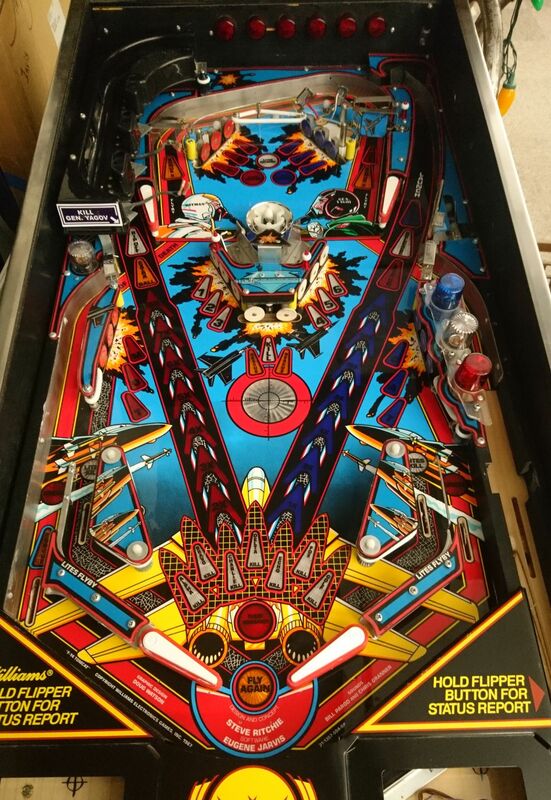 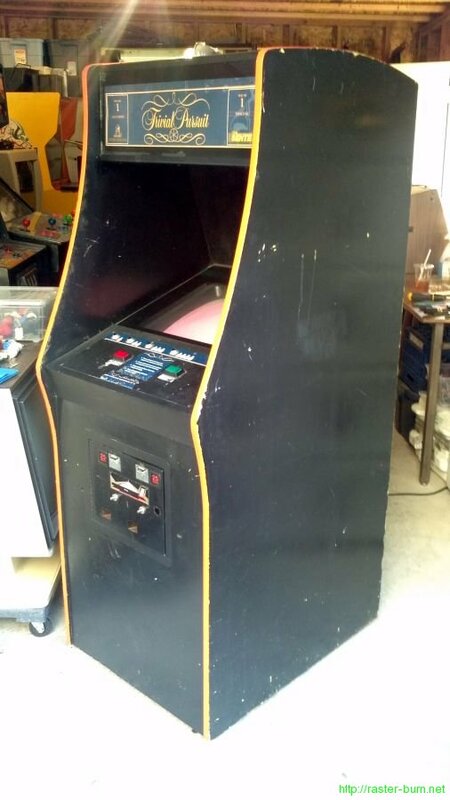 Now that Big Guns is back together I’m going to swap it in for Sorcerer at the office and bring that one into the shop for some MPU diagnosis… After having several hundred balls played through it without a hiccup during a party the company hosted I turned it on the day after and it was resetting randomly during gameplay. 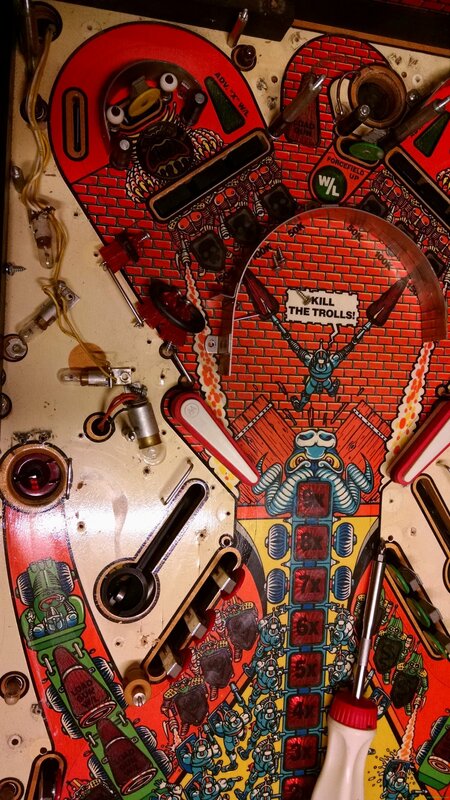 Poking around (very literally) narrowed the issue down to a bad connection or flaky component in the lower right corner of the MPU board, but tracing it further than that is more than I want to do with the limited tools I have at the office.